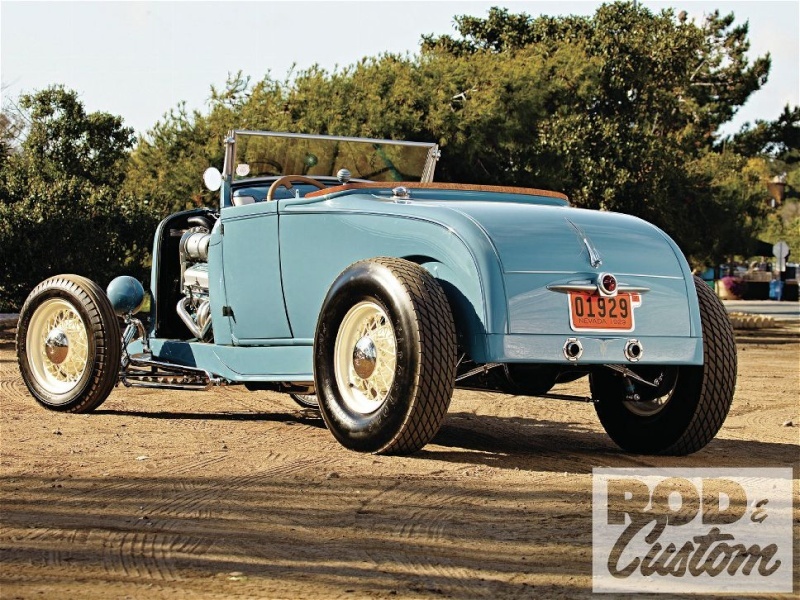 Nick Kallos’ ’29 on Deuce ’rails first came to our attention when we walked out onto the floor at the Grand National Roadster Show earlier this year to check out the contenders for the America’s Most Beautiful Roadster (AMBR) title. For the first time in years that list contained at least three owner-built cars, at least that we know of. We’ve already brought you the “Takeout T” from that bunch. 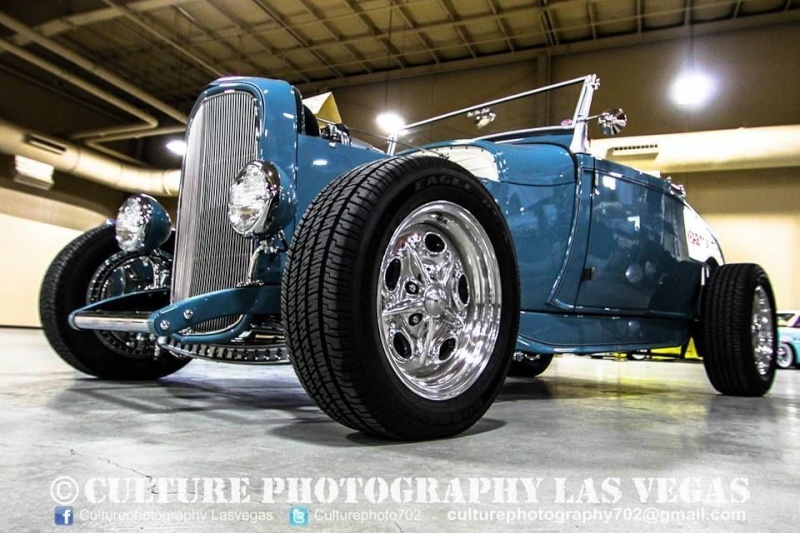 Note we didn’t say homebuilt cars, as Nick was given the opportunity to put his A together on the floor of SO-CAL Speed Shop Las Vegas, in full view of customers. 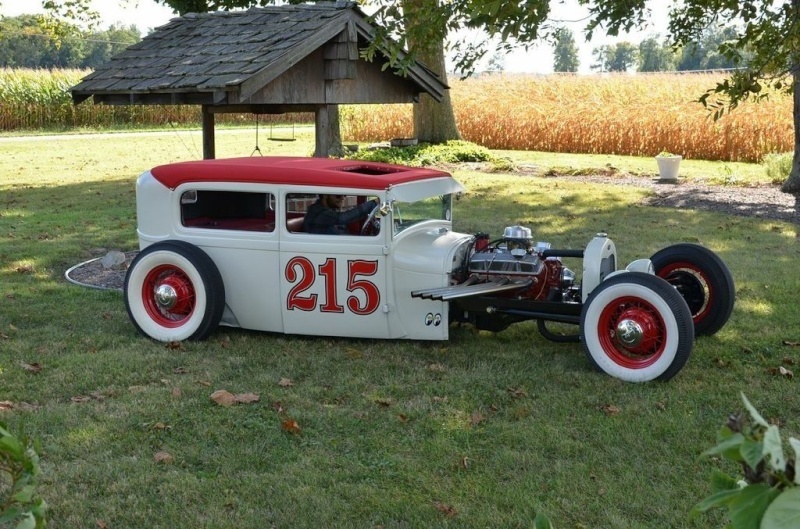 As Nick says, “For 30 years I’ve dreamt of competing in the GNRS as an AMBR contender, with a simple, cool car, put together not by some ‘name’ rod shop, but by me and some of my friends in the back of a speed shop.” That dream was specific about the color, stance, and old-school look, too. 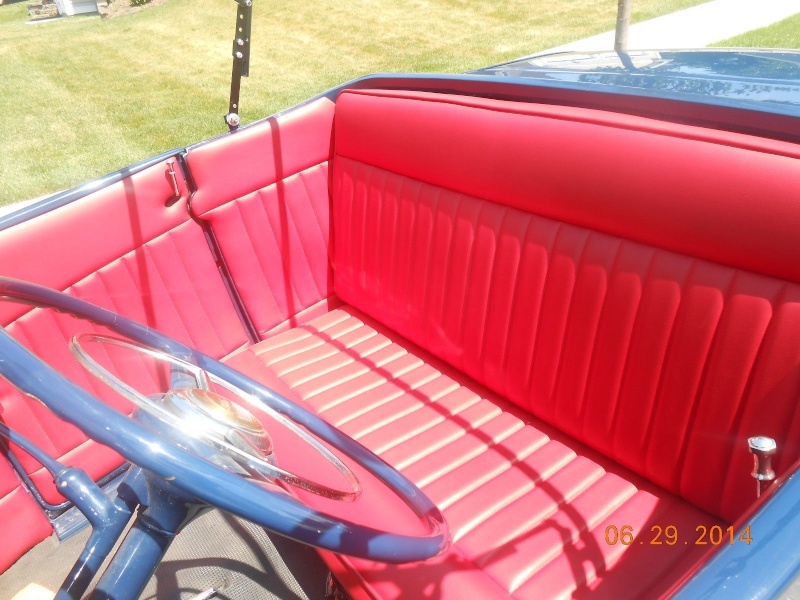 “The color was easy; ’50 Chrysler Haze Blue,” Nick says. 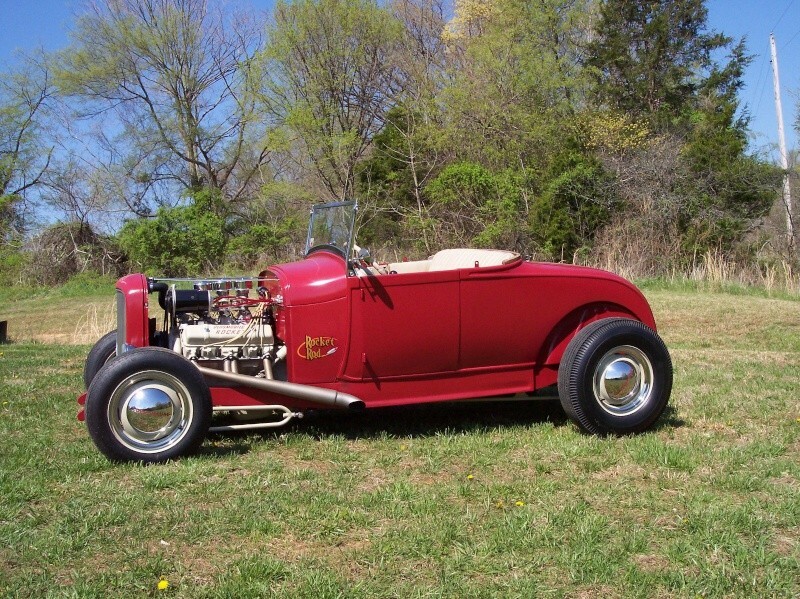 “My dad had one on the farm when I was 12, and that was all he’d let me practice buffing on. I just love the color. 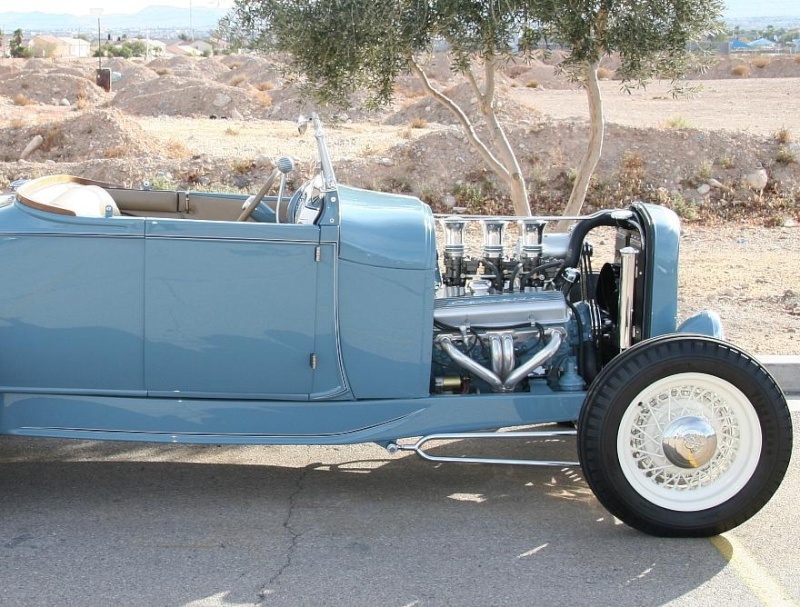 You probably noticed that there’s not a whole lot of chrome on this roadster. Instead, much of the brightwork is powdercoated. 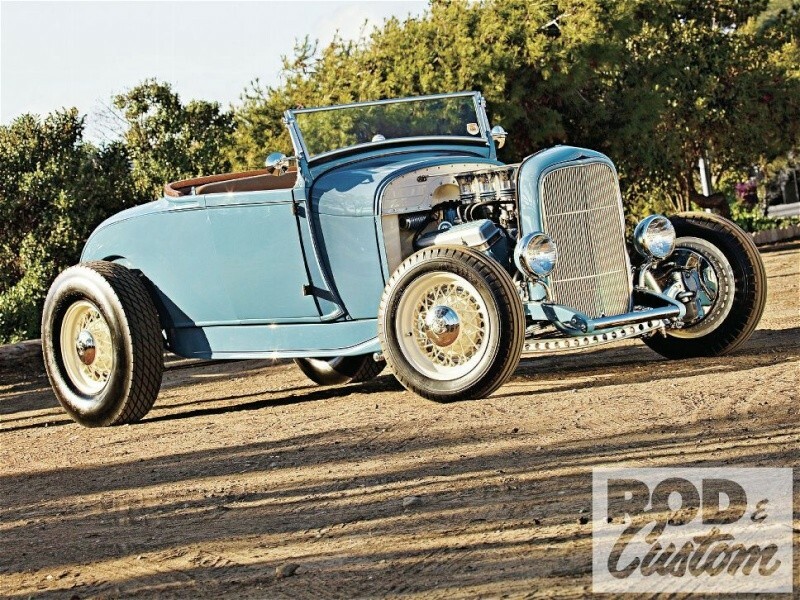 For one, Nick prefers the look to chrome, plus again it’s a little different, and secondly, given that the car has been driven every day since leaving the Roadster Show, and Nick has plans to use it for a number of long trips, it’ll stand up to road miles better than chrome. 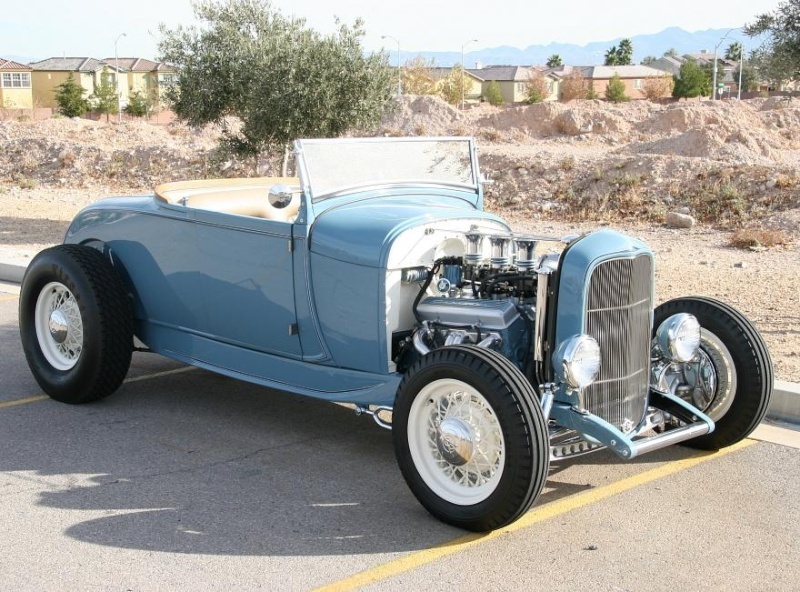 Seeing as Nick Kallos built the roadster in full customer view at SO-CAL Speed Shop in his hometown of Las Vegas, it would have been rude to use anything but a SO-CAL ’32 frame! 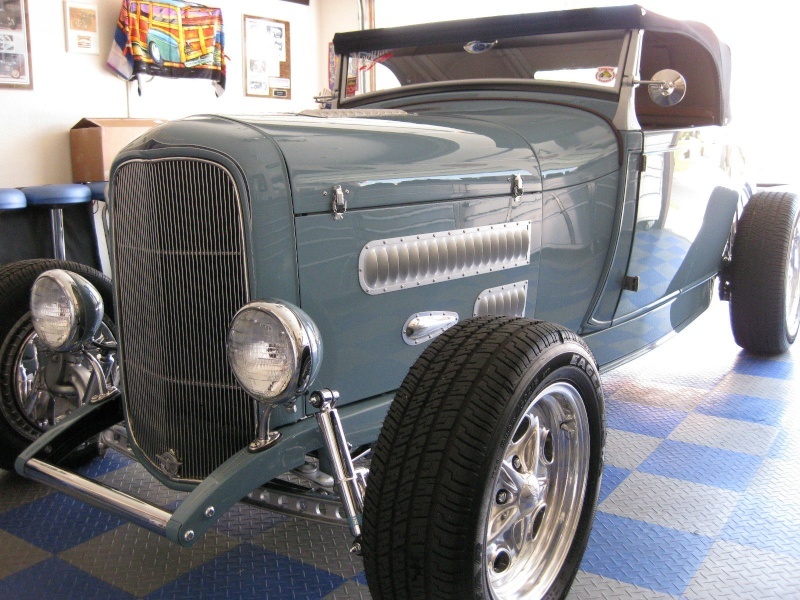 This one’s been pinched 2 inches at the cowl to follow the lines of the Model A body. 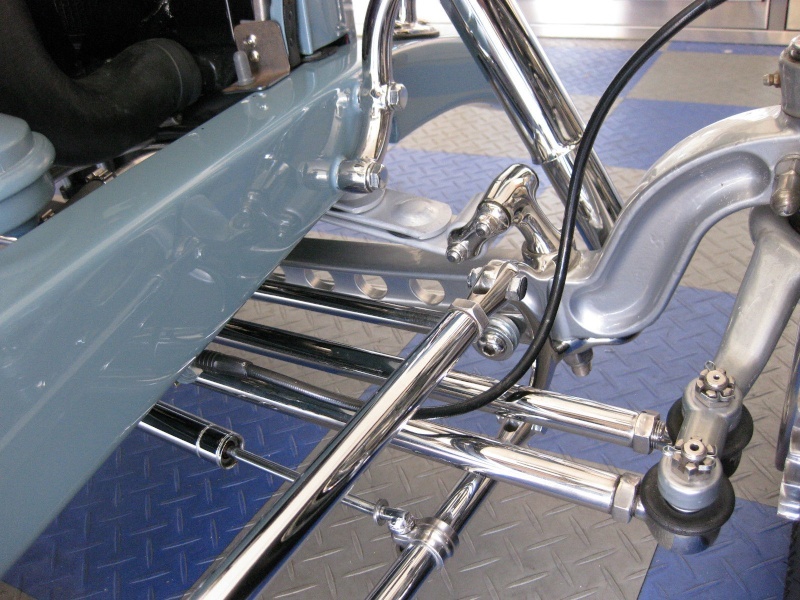 It incorporates tubular center and rear crossmembers, while Nick modified the front of the framehorns to wrap around the chromed spreader bar. More SO-CAL products include the 4-inch dropped I-beam, spindles, shocks, Panhard bar, pedal assembly, and front brakes, the latter being discs hidden inside fake drums, though unlike most, these drums are not polished but feature an as-cast finish (you get the feeling working so close to all those parts on the shelves might have been useful?). 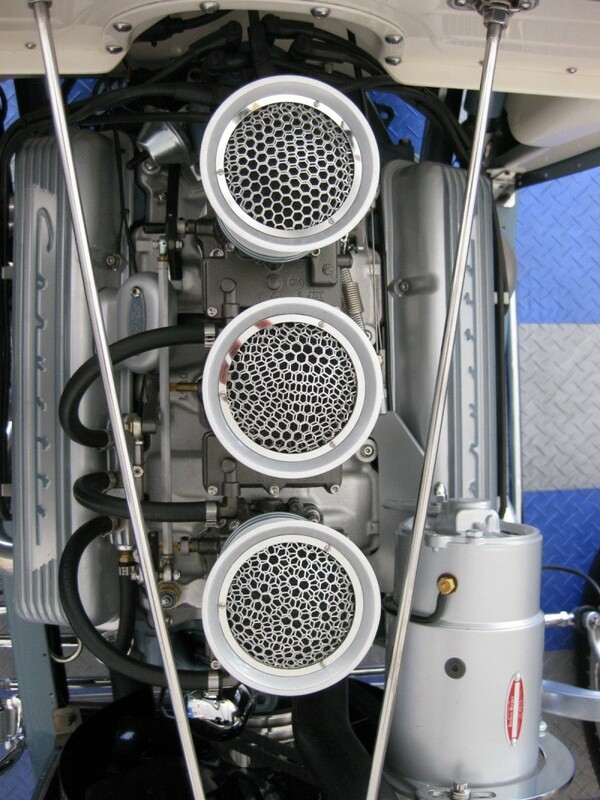 All the chassis plumbing is stainless steel with the one-off fuel tank mounted behind the seat, fabricated by Mondo and Victor of the Nevada Scorpions. 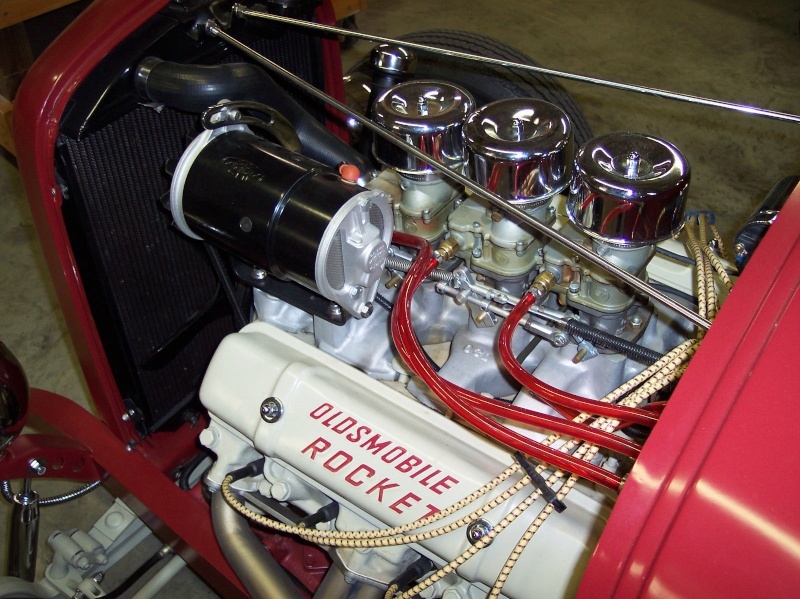 An ’09 350 Chevy powers the roadster, sourced from GM Performance Parts. 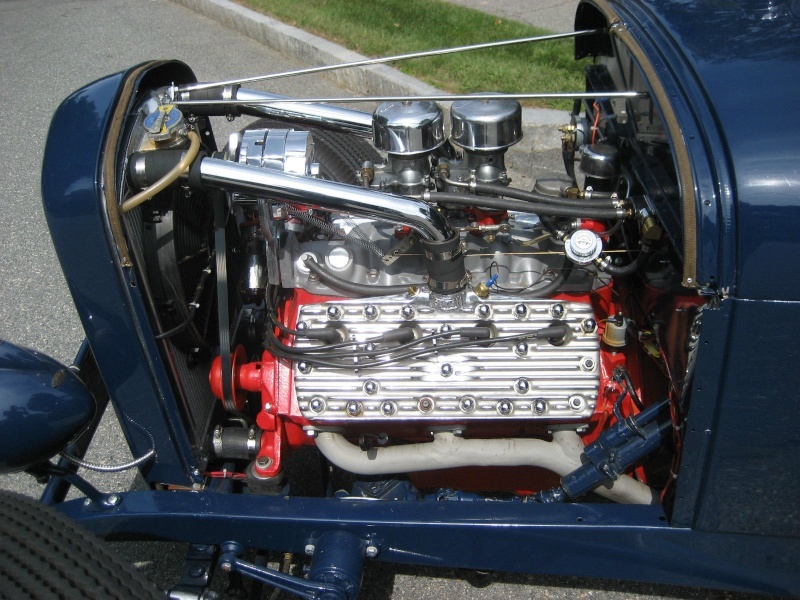 The 8.5:1 engine runs iron heads, with fuel supplied by a trio of Rochester carbs atop an Offenhauser 3x2 intake. 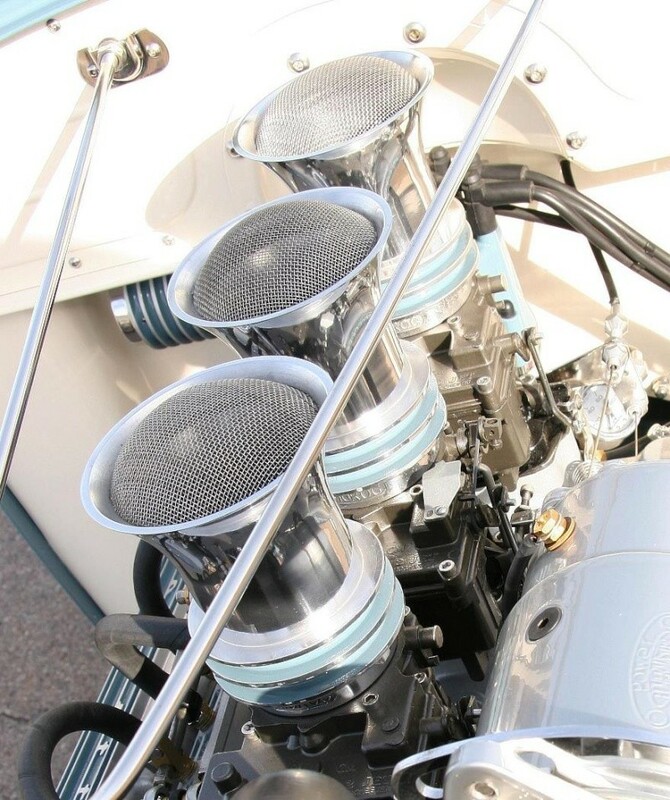 Edmunds air cleaners with K&N filters top it all off. 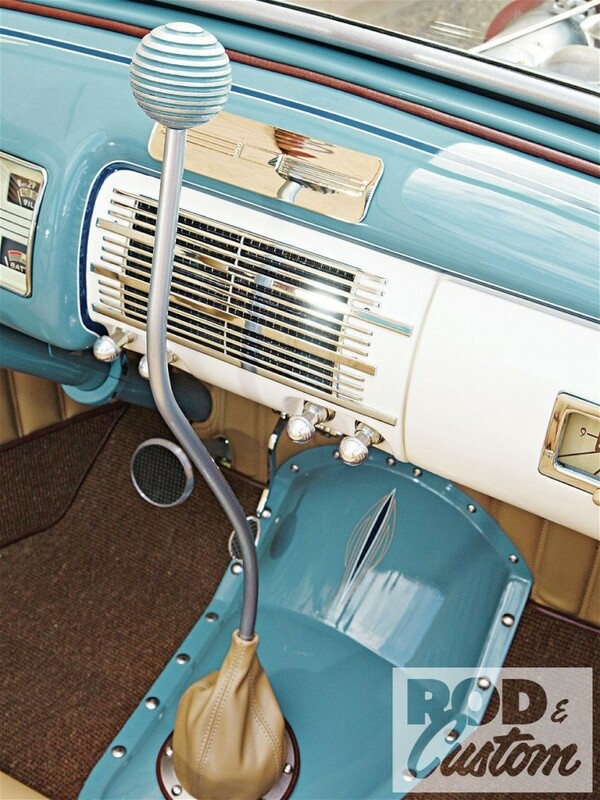 Original finned Vette valve covers keep things nostalgic, while an MSD ignition and Taylor plug wires ensure it runs perfectly. 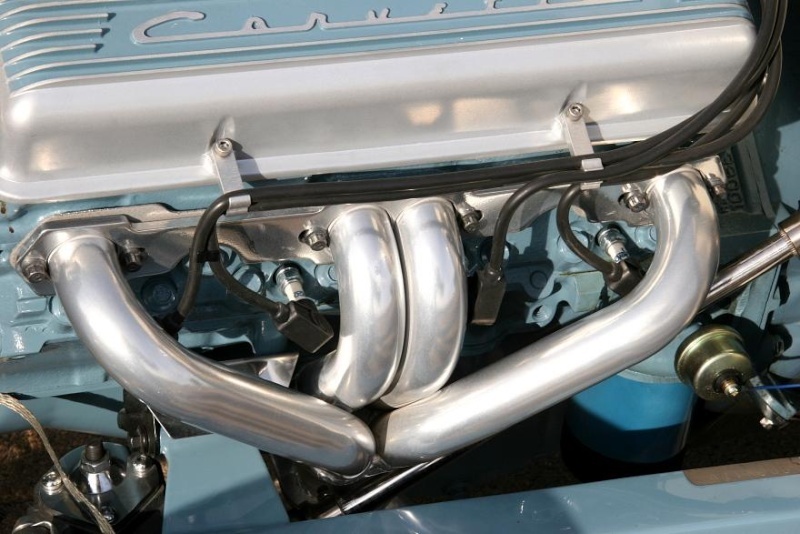 The custom headers are Jet Hot coated, pushing the gases through a one-off exhaust system made from mandrel U-bends, incorporating MagnaFlow mufflers. 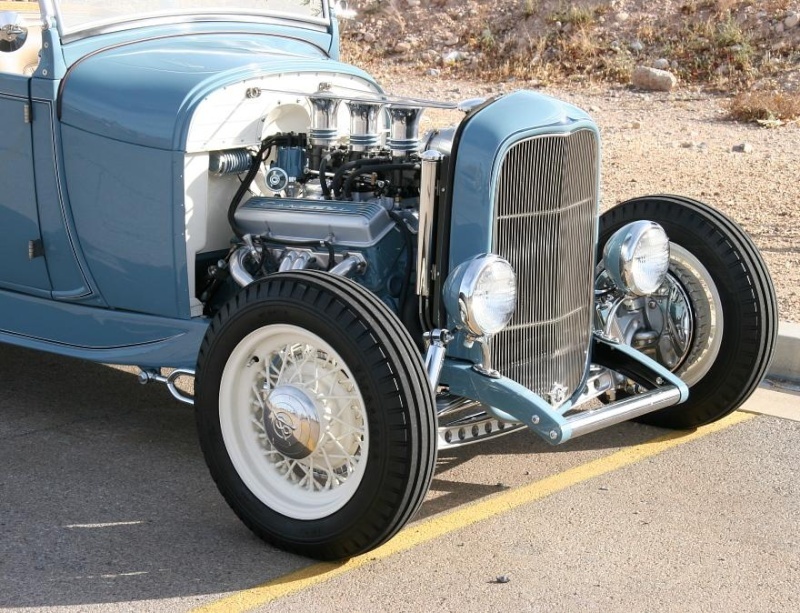 A Walker radiator keeps it all cool in the Las Vegas desert temperatures. 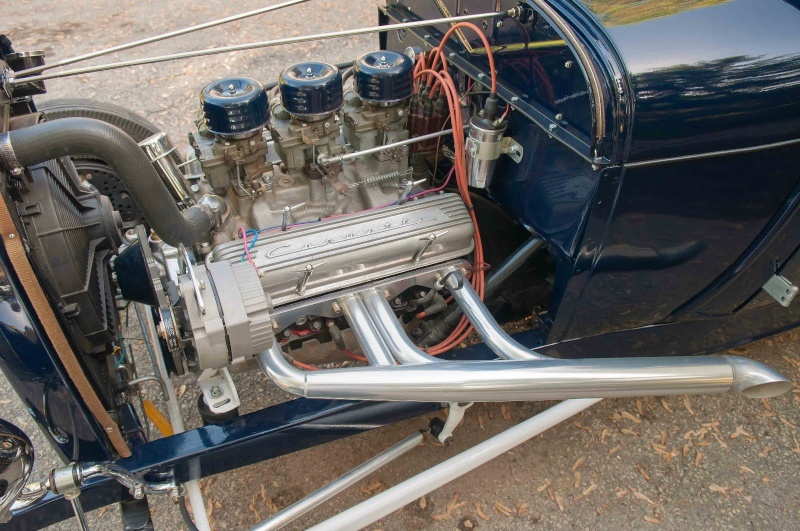 Performance Plus assembled the TH350 with a shift kit, from where an aluminum driveshaft feeds a Currie Enterprises 9-inch rearend with a 3.50:1 ratio differential. 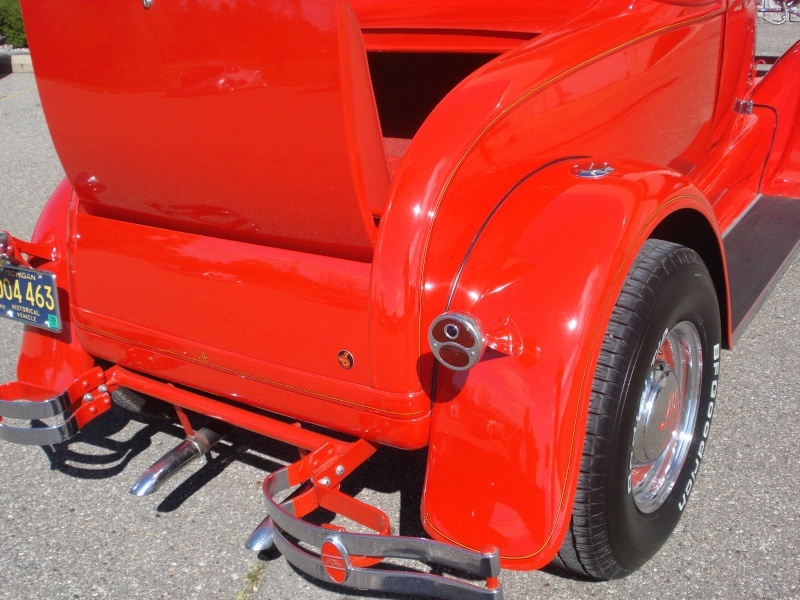 Ladder bars, a Panhard rod, and transverse spring from SO-CAL Speed Shop keep everything in place. 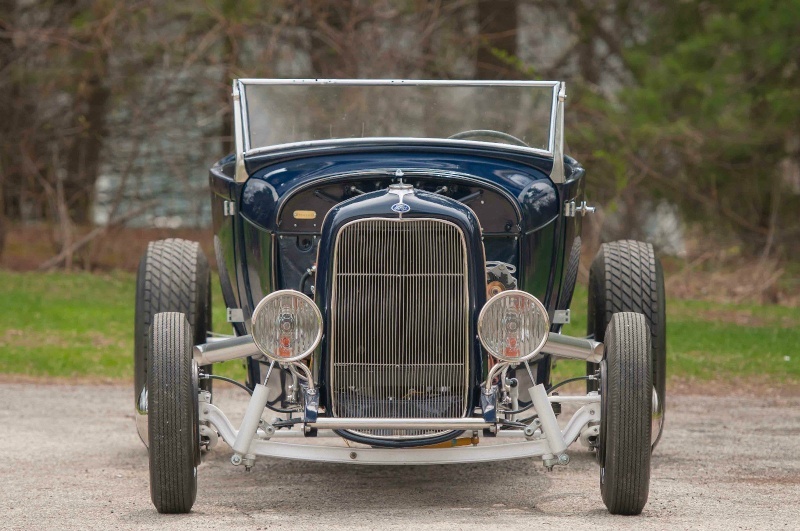 There’s a 16-inch Wheel Vintiques wire wheel at each corner of the roadster, painted off-white to match the firewall, and wrapped in Firestone rubber, 16x6 ribbed fronts and 16x8.90 dirt track rears. 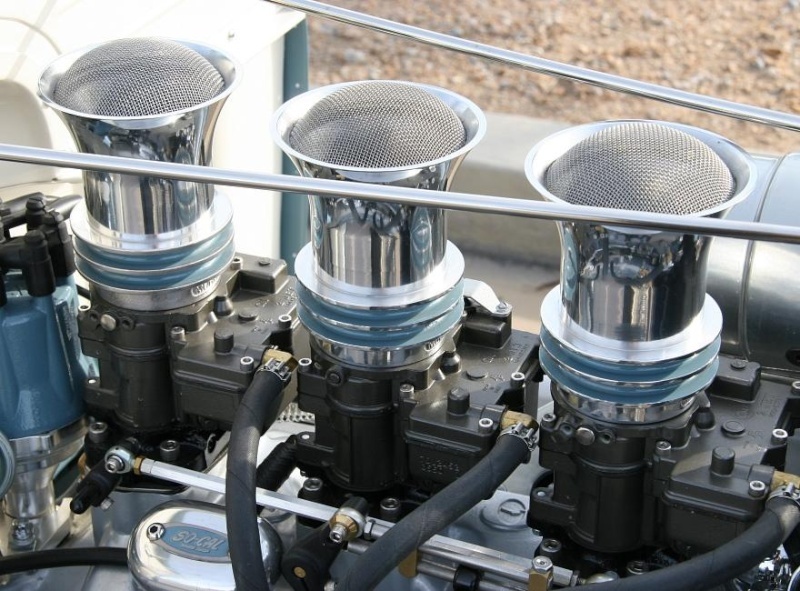 Stainless V-8 caps are all the dress-up they need. 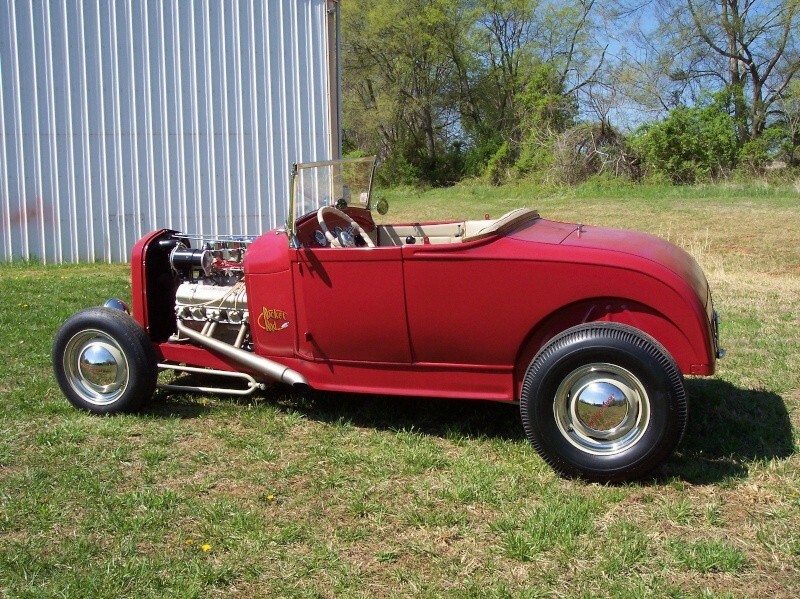 Starting with a new Brookville roadster body, Nick extended the rear panel to make room for the exhausts to exit through it, C-notched the rear wheelwells, channeled the floor, and formed a new firewall, using half of a differential floor cover to form the distributor recess. The other half was used at the rear of the trans cover. 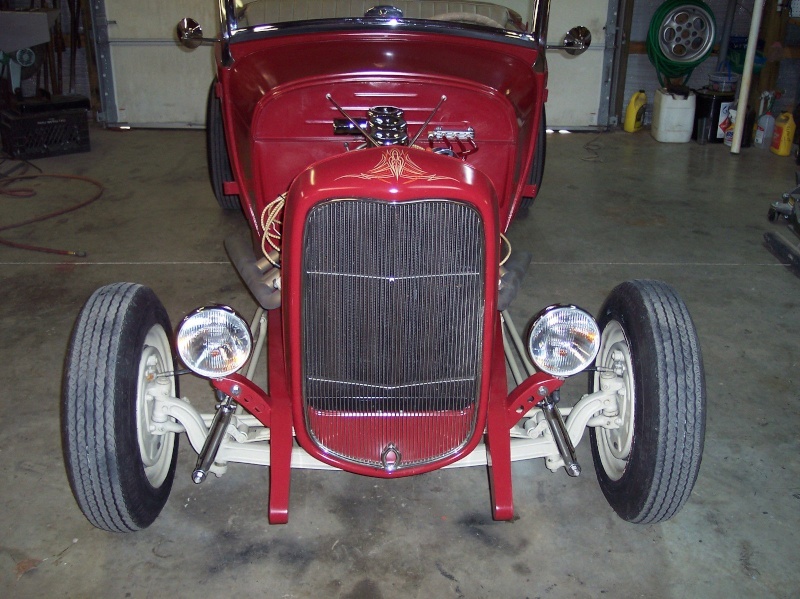 The Deuce grille was trimmed and lowered and the framehorns modified to wrap around the spreader bar. 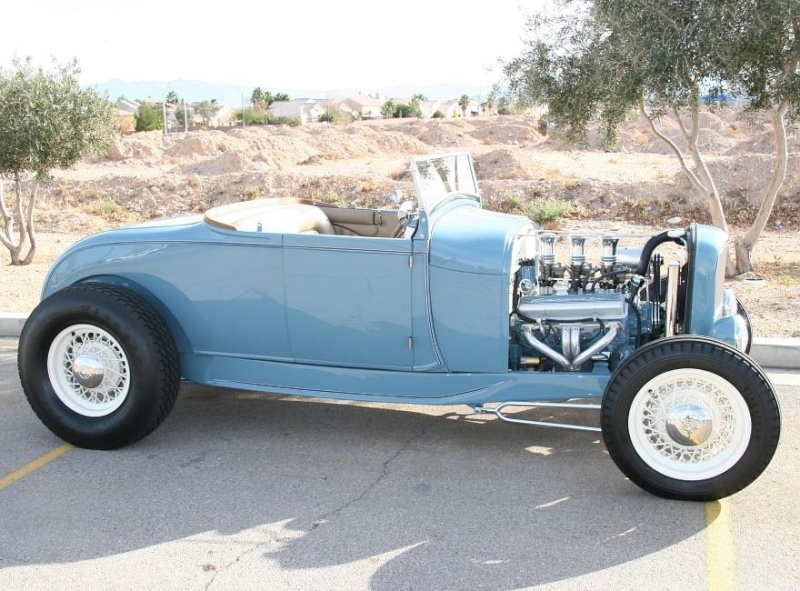 Mondo and Victor prepped the body before Wray Heffelfinger sprayed the PPG Chrysler Haze Blue. Lenny Ribaudo then added pinstriping. 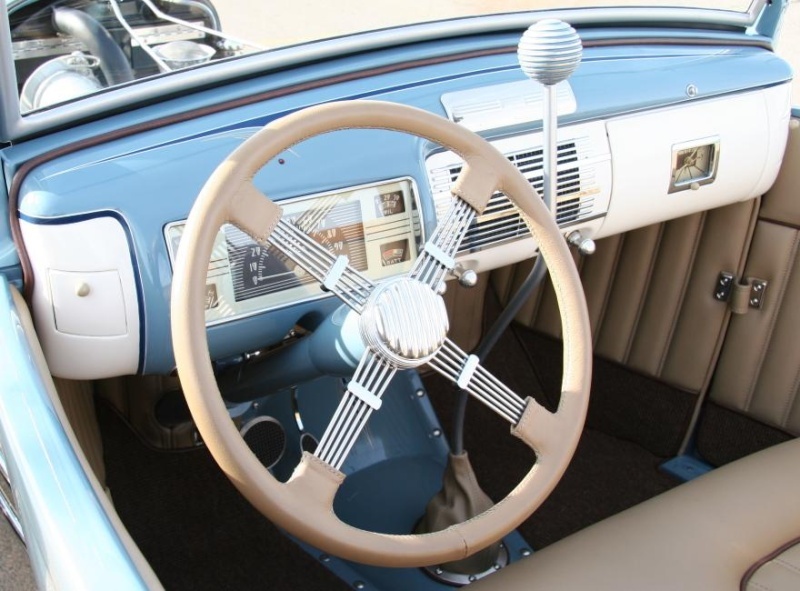 A rear light/tailgate handle from a ’49 Plymouth woodie was added, while a violin maker friend formed the intricately curved wood around the rear of the cockpit from a single piece. 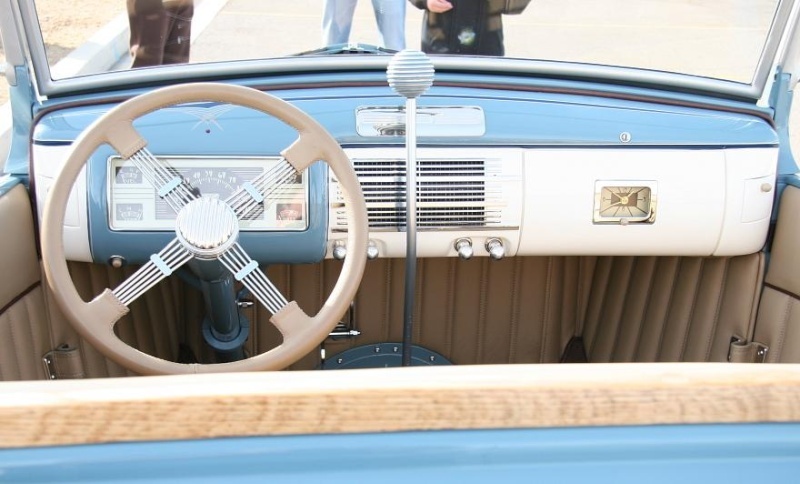 The centerpiece of the interior is the ’40 Ford dash, which was actually easy to fit once the corners were pie-cut. 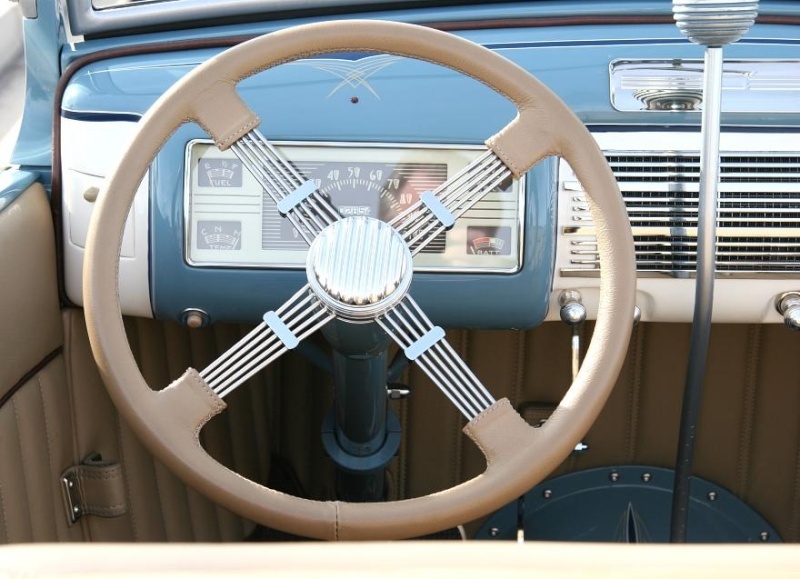 A 15-inch SO-CAL four-spoke steering wheel is bolted to a Mullins column. 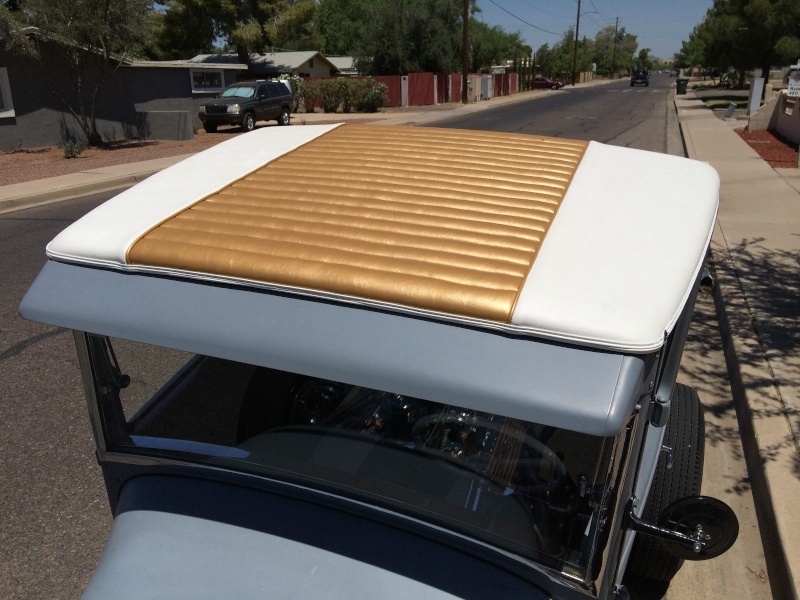 An aftermarket seat frame was modified then covered in light oak colored Corinthian Endura vinyl by ABC Upholstery in Las Vegas, complemented by Mercedes Coco Brown carpet. 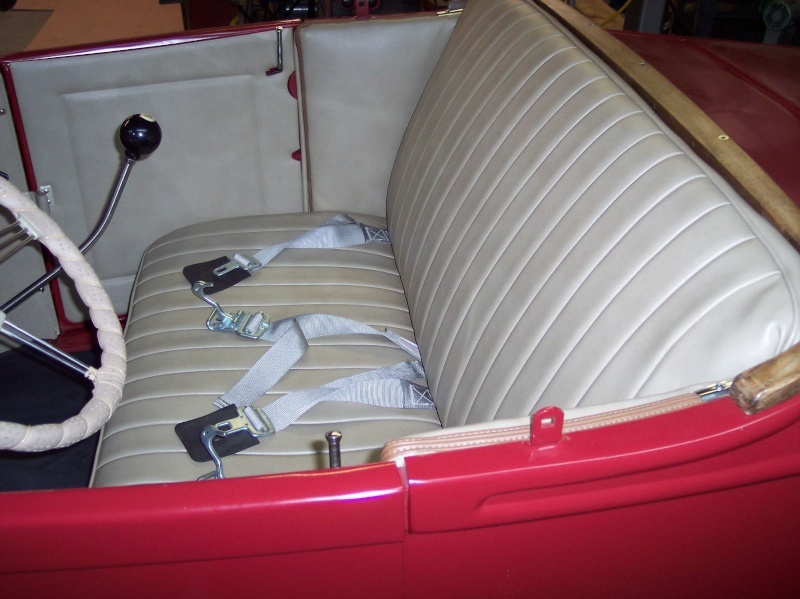 Nick installed a Haywire wiring harness, added custom seatbelts, and hid the battery behind the seat along next to gas tank. 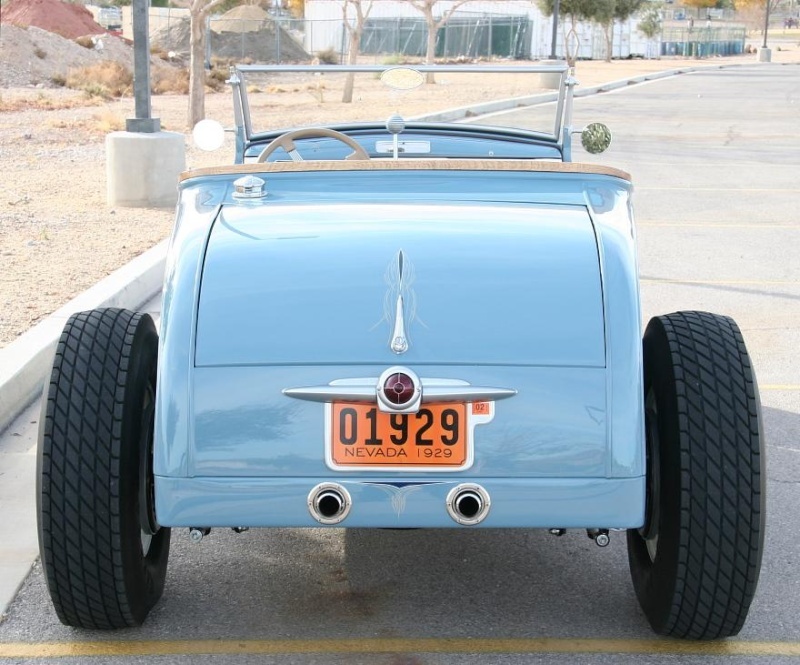 Covering my 1929 Ford Model A Roadster front to back is going to be an interesting story because it started out as a tail light. 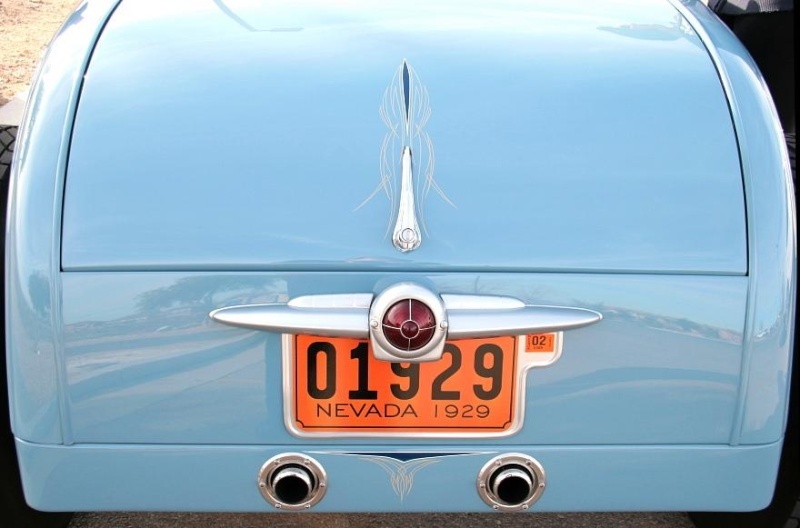 I went on-line and found a tail light that was very art deco. 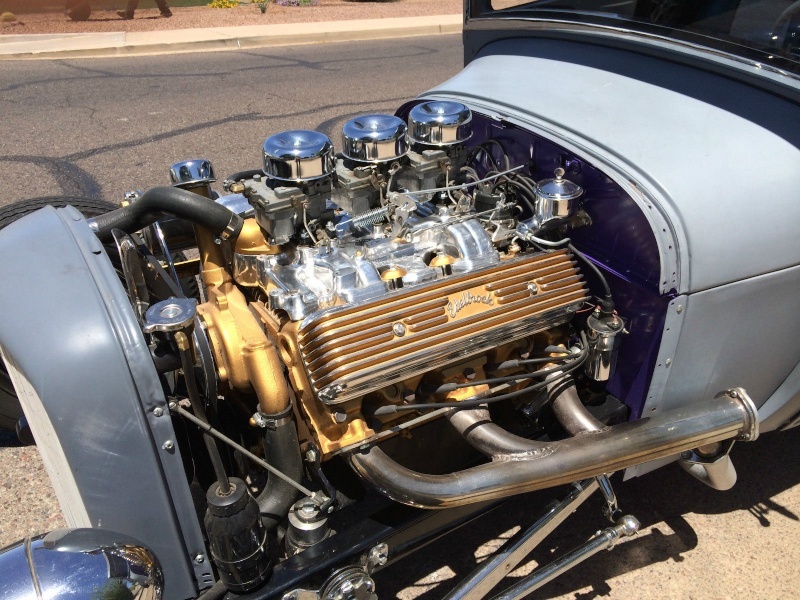 It was off of a ’49 Plymouth woody. It was a very interesting piece but big and bulky and had a lot more stuff on it that I wanted. So we sliced and diced it, and I must have sanded on that thing 30 or 40 hours. And when I say “I”, I mean myself and my metal guys, Mondo and Victor of Nevada Scorpions. Mondo and Victor were the leaders with my metal and body work. 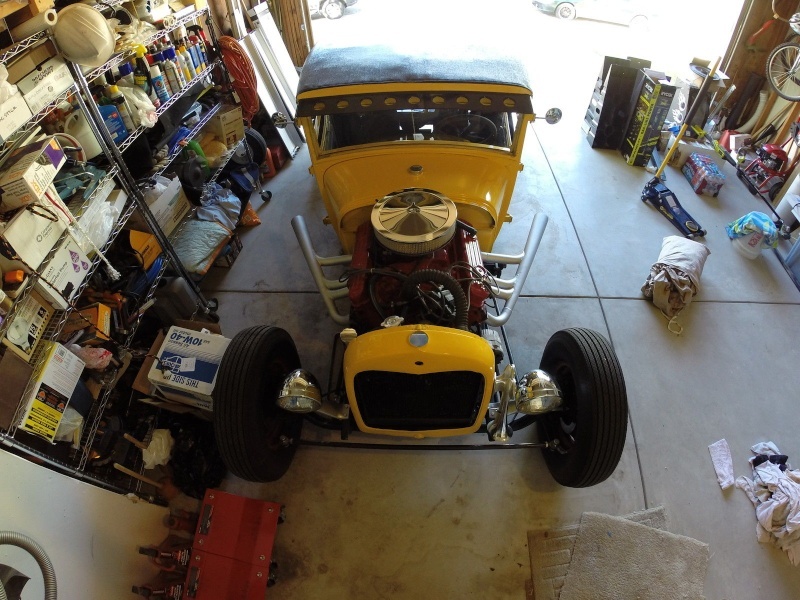 I knew what I wanted when I built this car but they were the guys who made it happen. 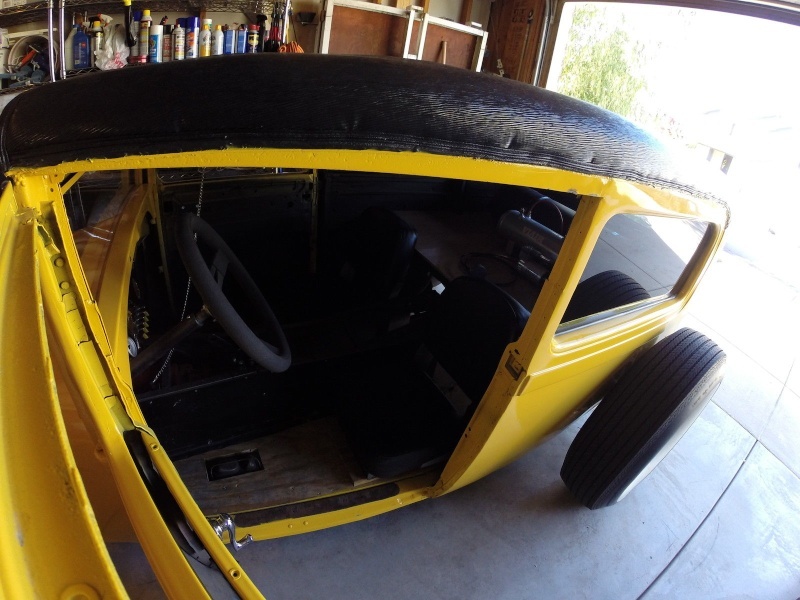 I built this car on the floor of SoCal in Las Vegas so everyone could watch the progress. 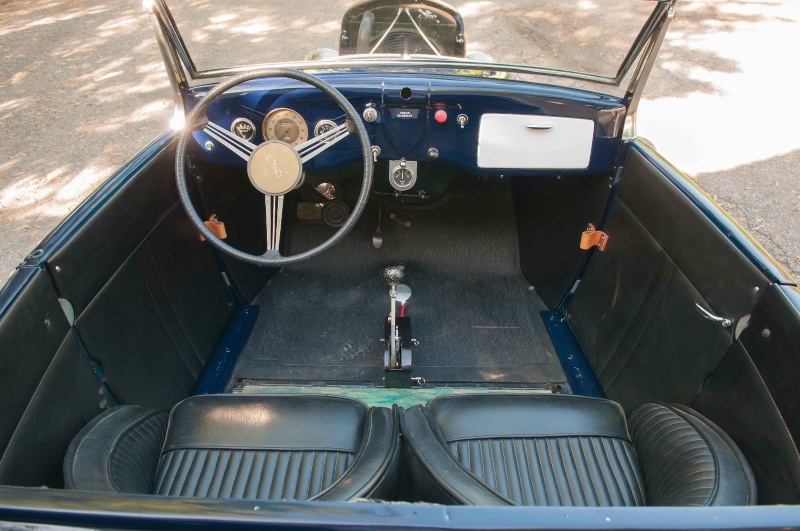 I want to start with the front of the car and take you through some of the different parts that are interesting to me. 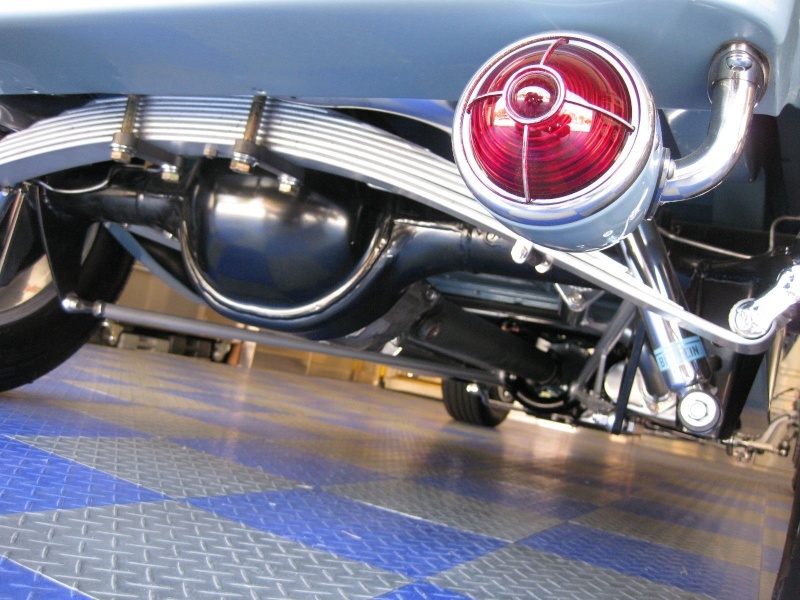 When you start at the front of the car you’ll see a little chrome crossbar piece. There are a lot of things on this car that no one even knows happened. Even guys that know cars, they look at my car and they know something happened but they’re not sure what. 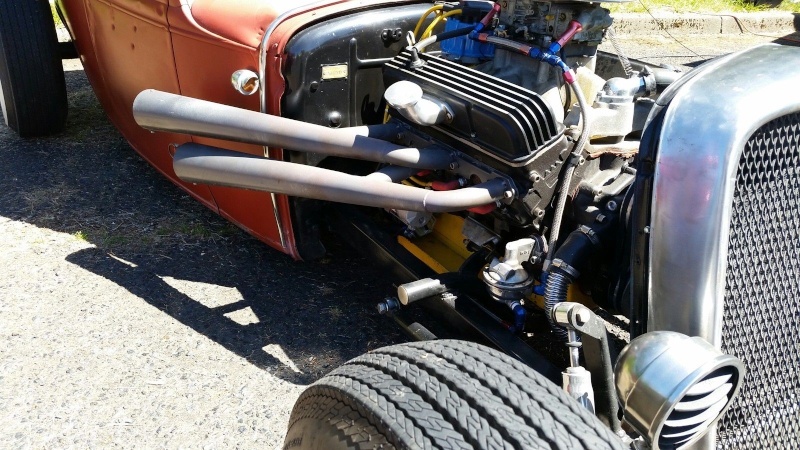 This crossbar took a 3″ piece of exhaust pipe — just bare metal. I had them cut it off and chrome it. Both ends have an ugly opening so I had Mondo and Victor curve the pieces to match the front piece. 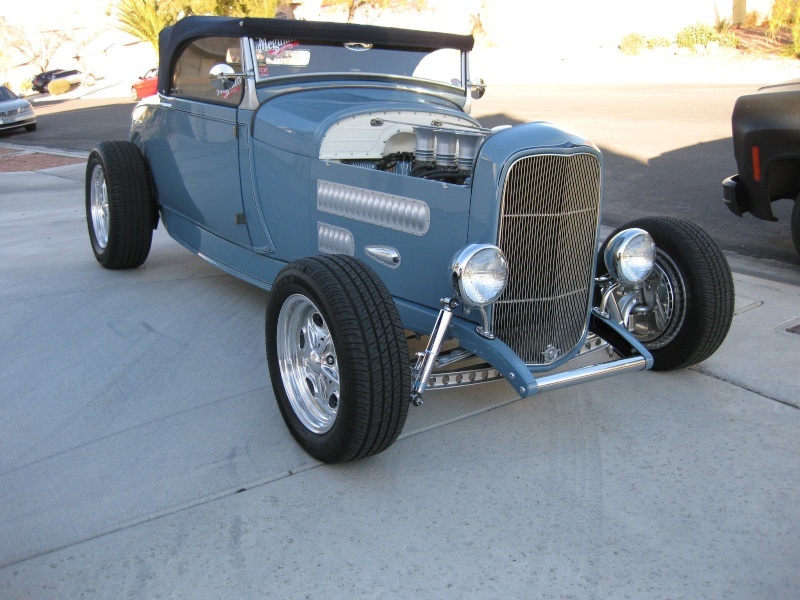 Then I had my body guy paint the ends blue and the center was chromed which gave it a finished look. 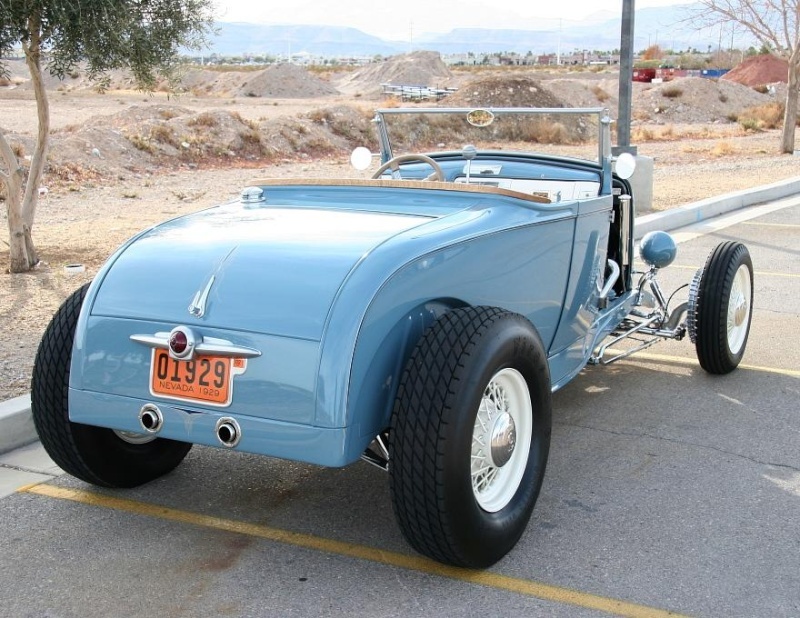 Keep in mind that Henry had fenders but as a fenderless car it looked open and bulky and ugly. 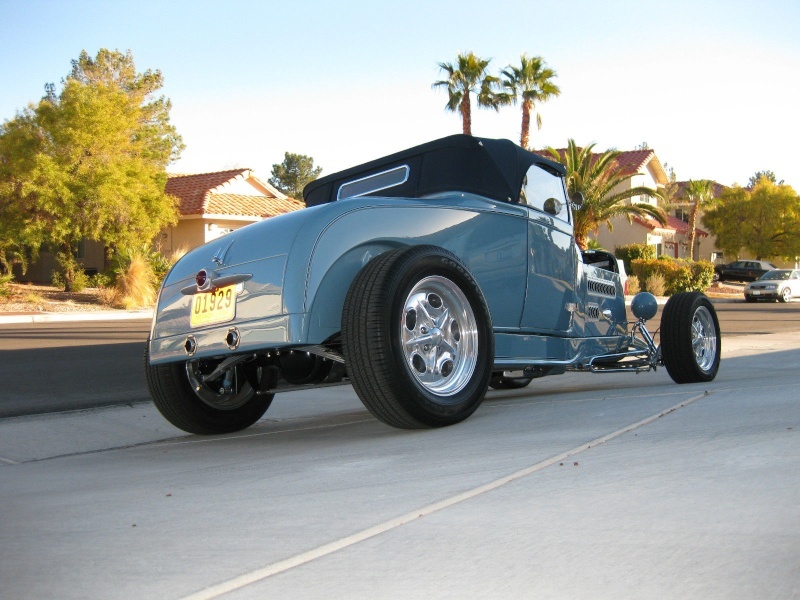 Starting off with the brake system, almost everything on this car is either SoCal or hand made. 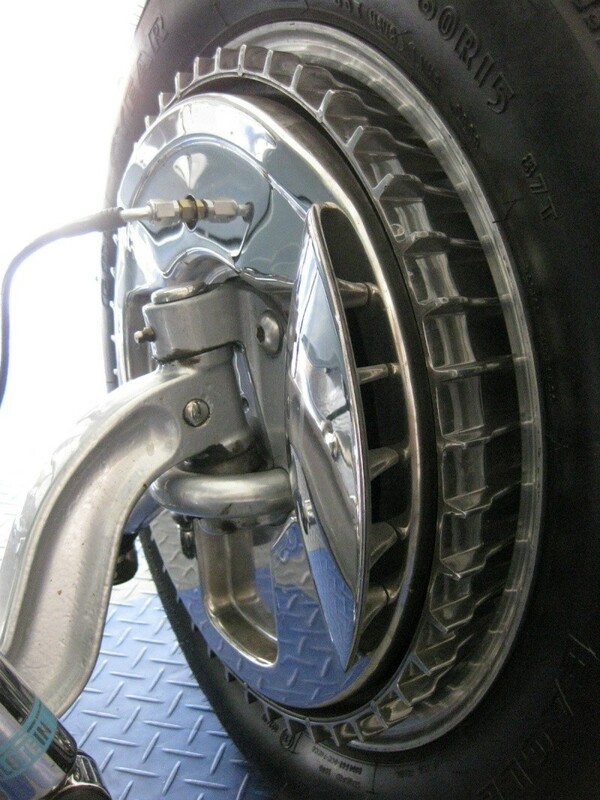 The SoCal brake system looks like old drum brakes but they are modern disc brakes inside. 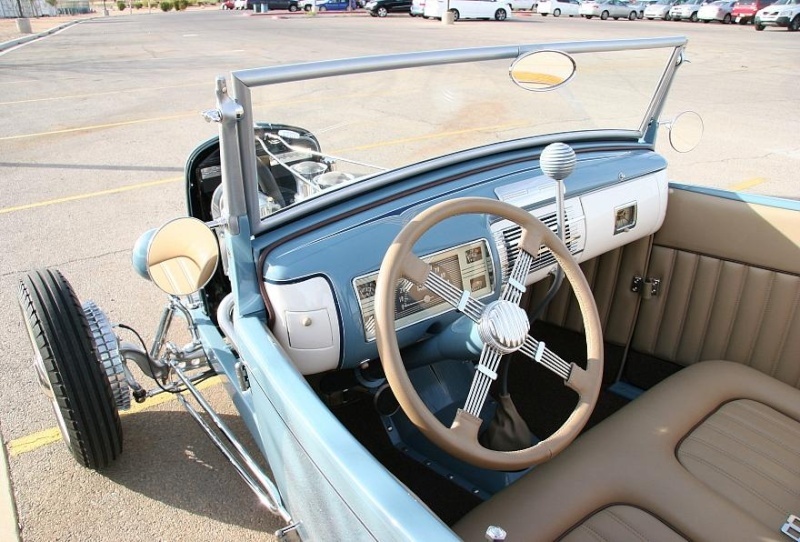 So when people walk up to my car it has the old school look that I was going for, but the brakes inside are high tech. 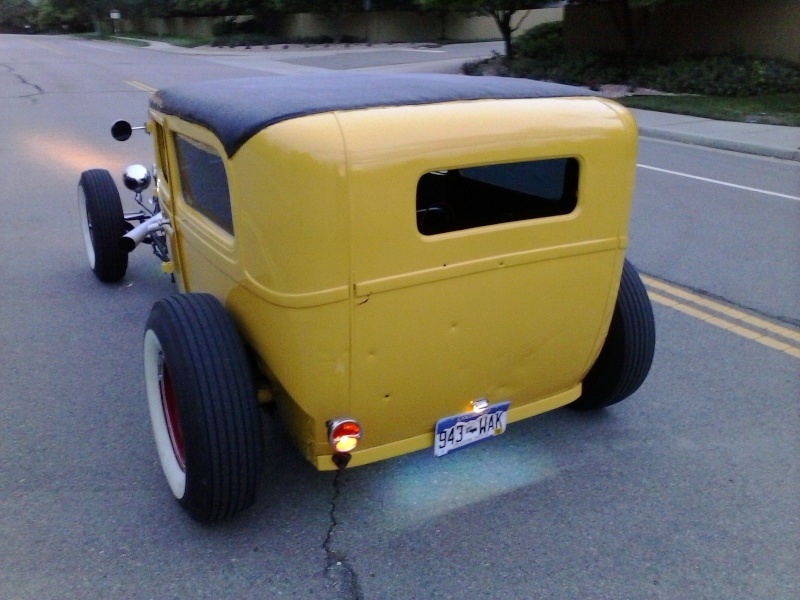 Back to SoCal, the frame of this car is a ’32 rails and it was pinched 2″. That means it was brought it in 2″ so the body sat on it perfectly — there was nothing hanging over. That’s a trick they used in the old days. 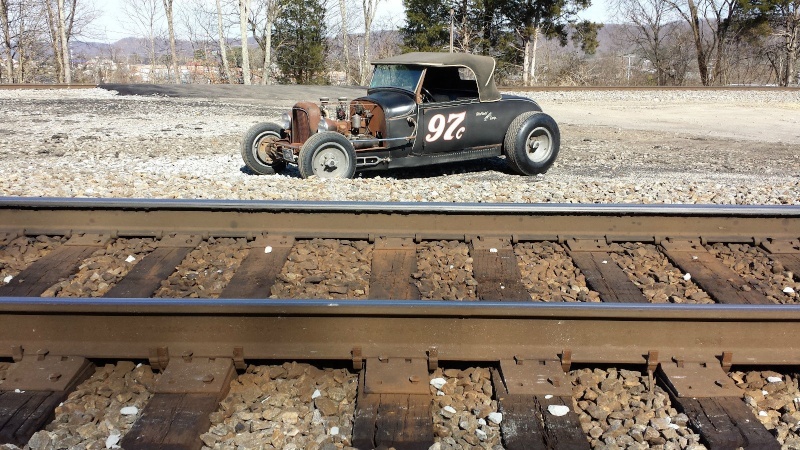 This is a Brookville body which is an all-metal body but it’s made today. It wasn’t perfect so we had to skim coat the entire body with Bondo. Just a very thin 1/8″ but we did the entire body to eliminate the ripples. 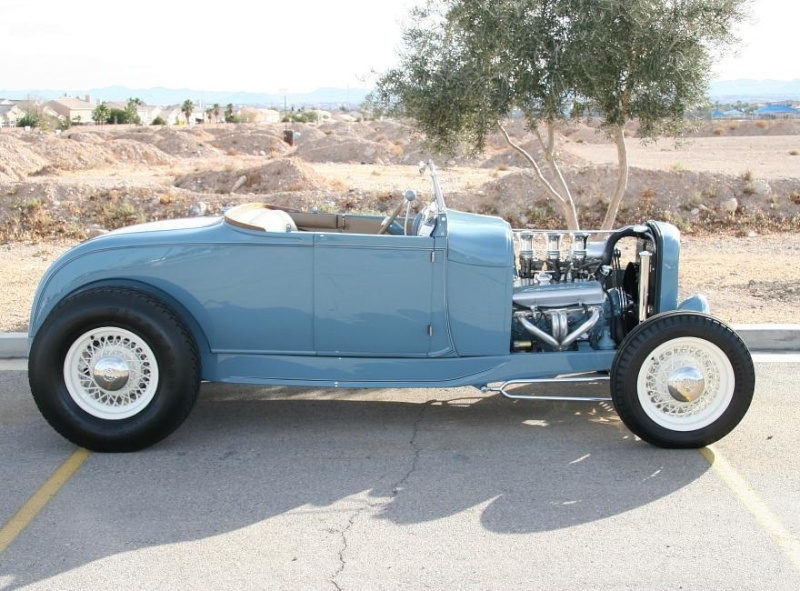 After the body was prepped it was painted by Wray Heffelfinger. 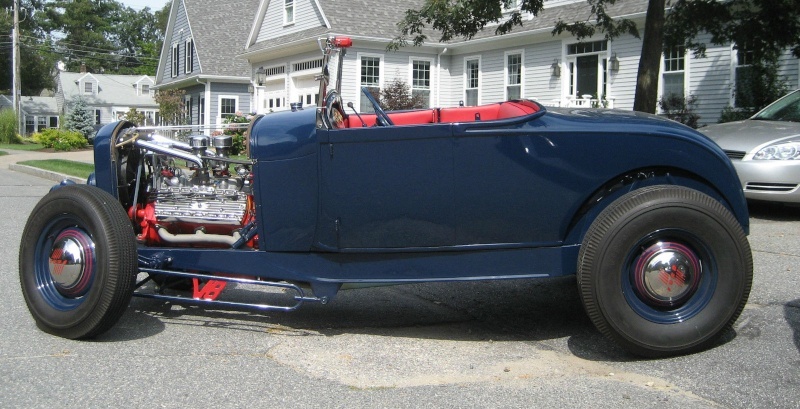 Continuing with what we did up in front, this is a ’32 grill shell, not a ’29. 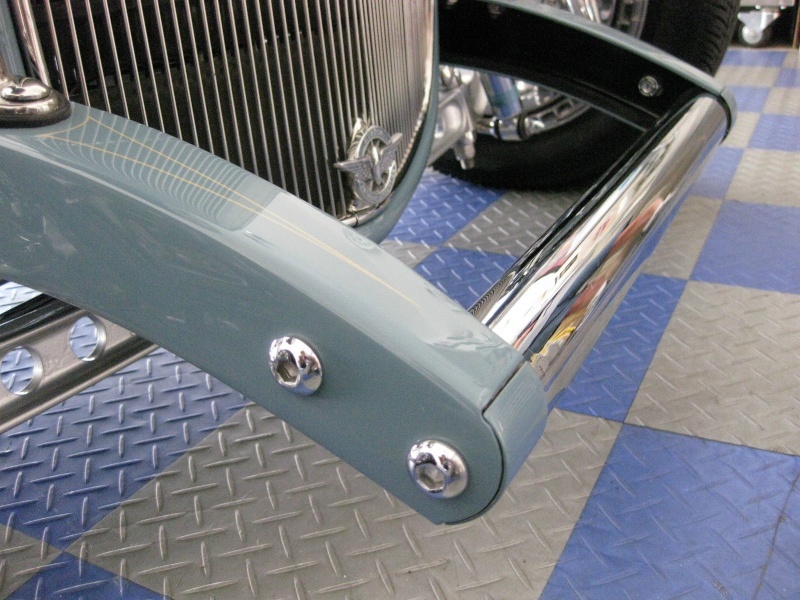 We had to cut out the grooves on both sides so that the cowl and radiator would line up. The entire firewall was done by Mondo and Victor. 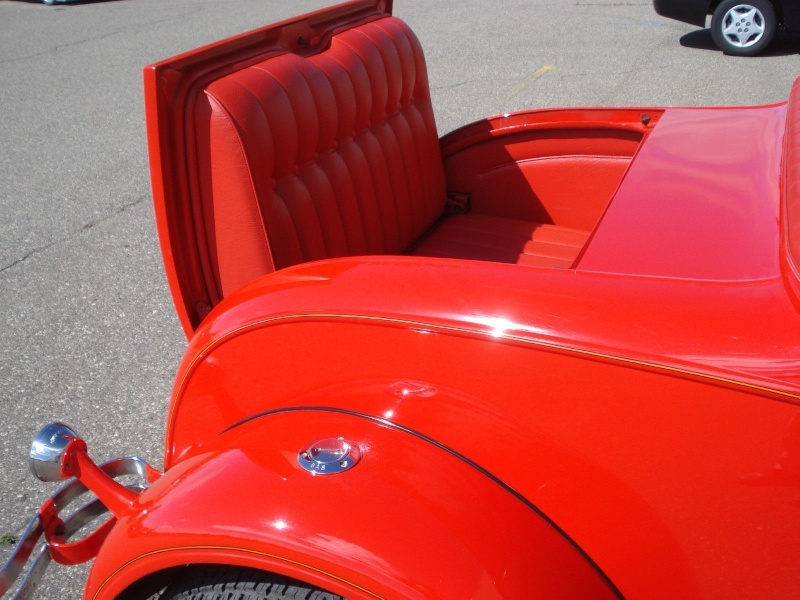 The leather piece around the cowl and the body where it meets was black rubber in the old days. 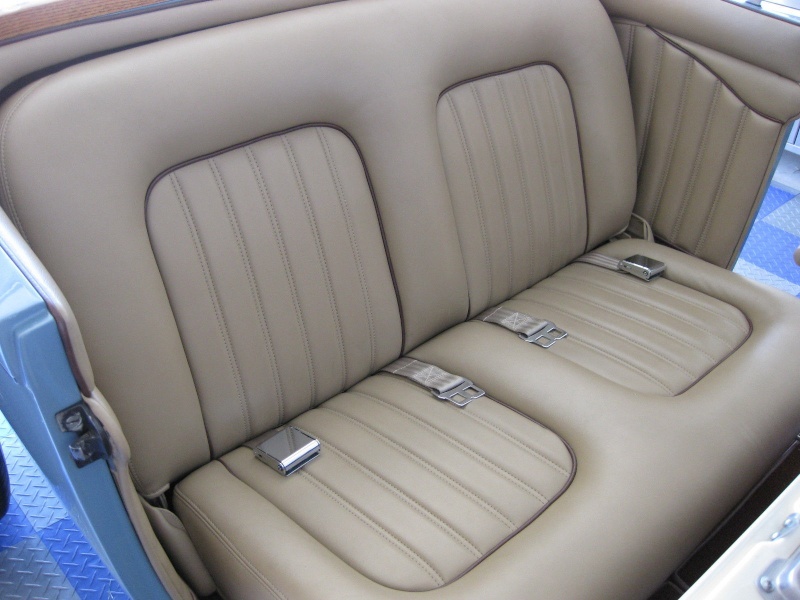 I took at piece of hard rubber and covered it in the brown leather that the interior of the car is trimmed in. Then I pulled it through and tightened that cowl back down. It was a mind blower how much work that required. 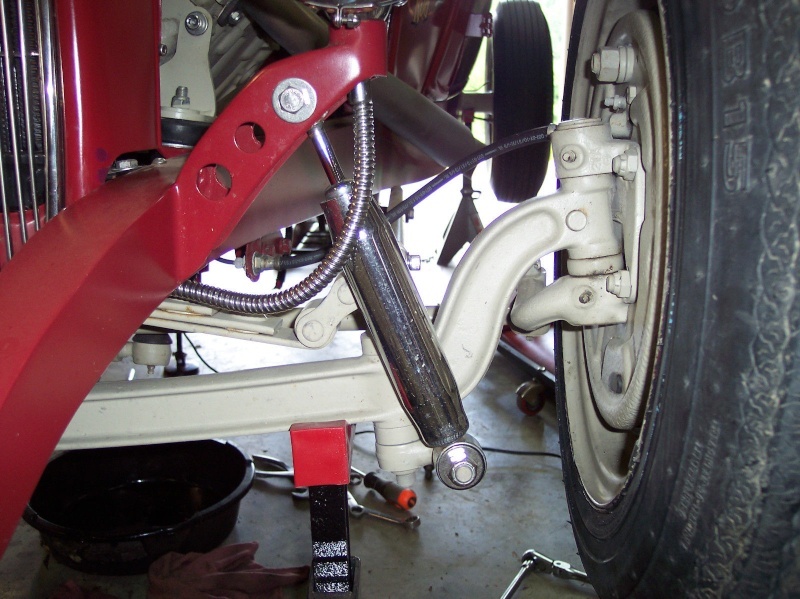 The front dropped axle is a 4″ I-beam drilled. The reason I called it drilled is that you see all these small holes in front. It’s strictly aesthetic. It’s nothing to do with working better or worse. 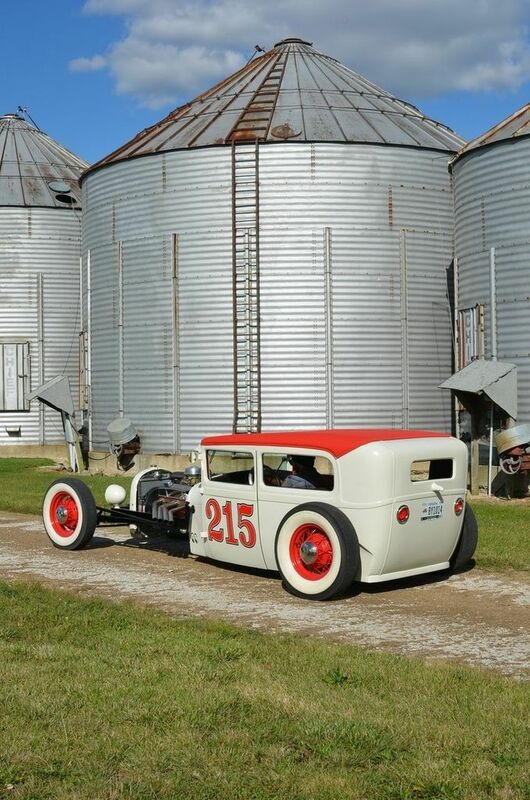 The tires are called dirt track on the back and tractor in front. They’re called “tractor” for the obvious reason that they are identical to the ones used on the tractors we had on the farm when I was a kid. The tires on a tractor would be angled so they would dig in but not get stuck. These tires in front look good but are horrible. As they say, I’d rather look good than feel good. They look great but don’t work very well. The side of the car has a hairpin. 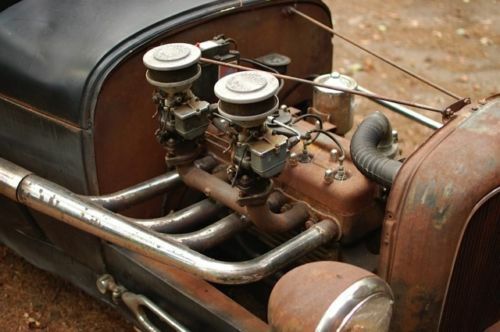 In the old days they had 4-bar and hairpin that connects your steering and axles together. They call it a hairpin but it looks like a paperclip. It’s named after a lady’s hair pin. 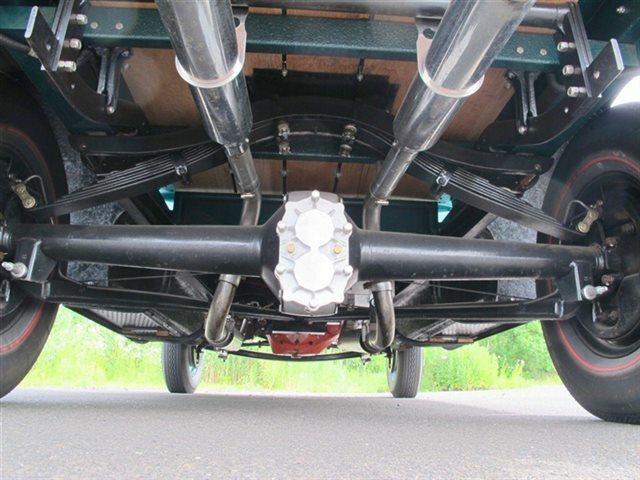 The undercarriage looks identical to the top. 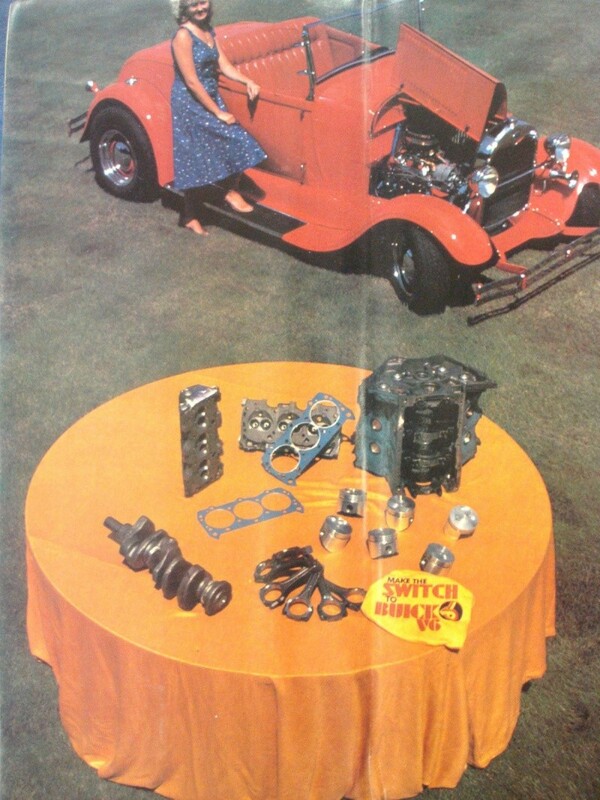 When my body guy got this car I built a table out of steel and pinched it 2″ in front. 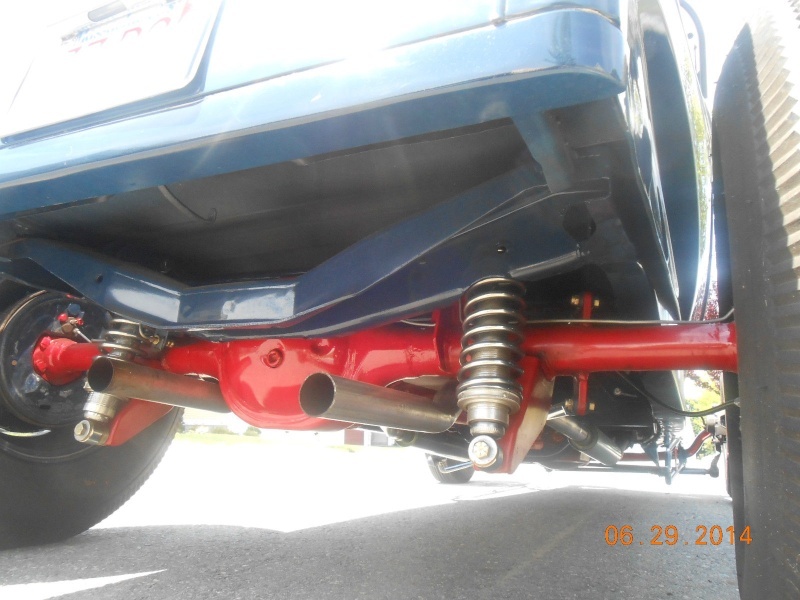 The body went on there on four steel stems and it was eye-level so he could get underneath to color, sand, buff and wax the car. As a result, the paint under there is identical to the top. Everything else is powder coated or chrome. 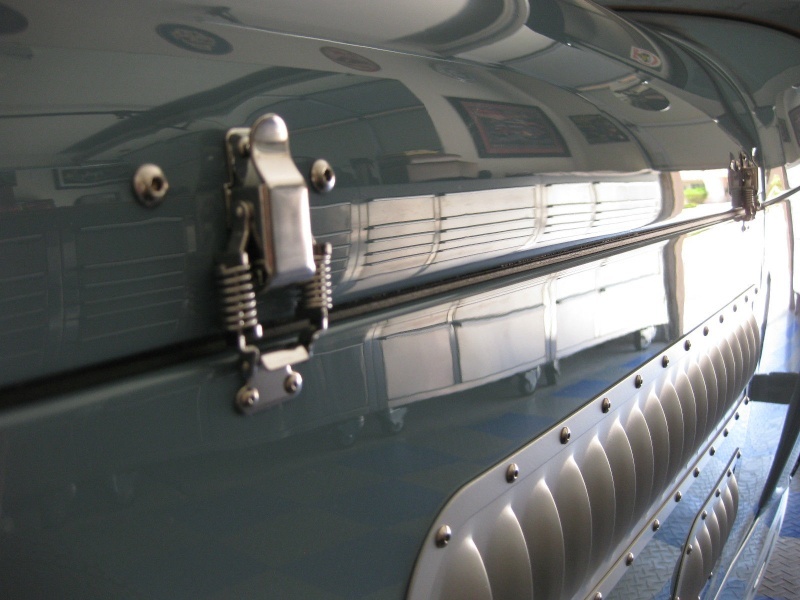 On the rear view, the tail light is a spectacular piece from a ’49 Plymouth Woody. As you can see, 90 percent of my car isn’t chrome. I got tired of cars having too much chrome. 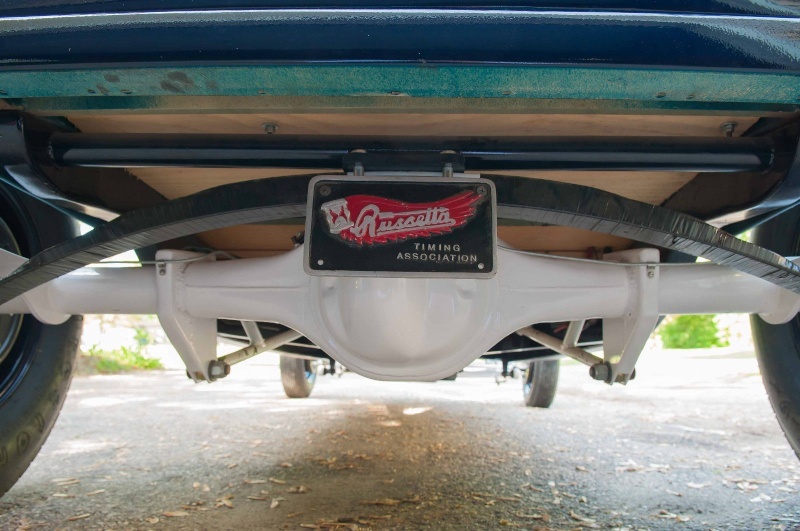 The lower pan where the exhaust comes out was a one-piece pan that was made by Mondo and Victor. The little circles that go around it were bought in a off-dirt store and I don’t even know what they’re for. 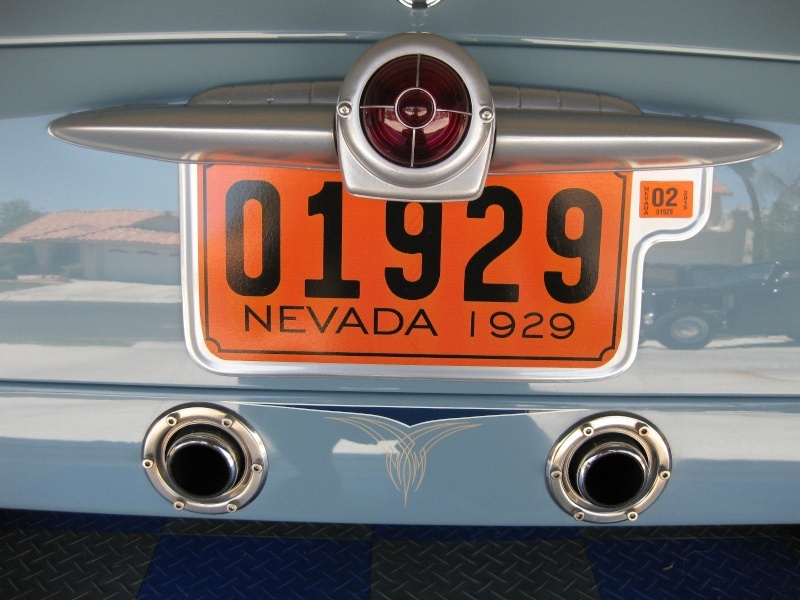 But I drilled the centers out, put holes in them and used them for circles around my exhaust pipe. I wanted the exhaust to come out the back. I think it adds a lot. 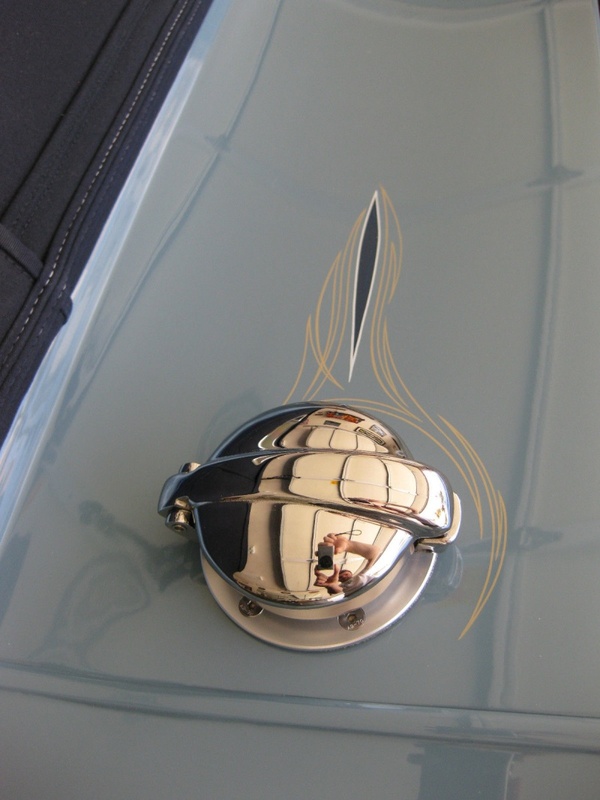 The gas cap is European, from a Monza race car, and very rare. 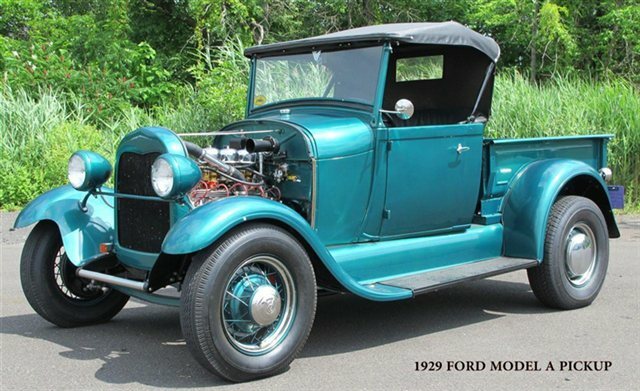 I found this one on-line and had it completely refurbished. It was expensive but I knew what I wanted and this gas cap was right one. 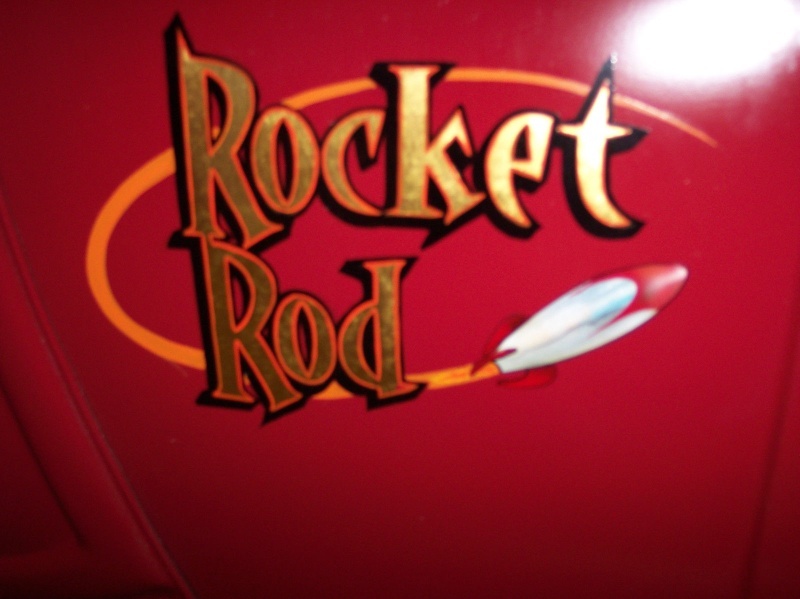 Lenny Ribardo did the pinstriping. He’s the last of the great pinstripers. I chose not to cover the trunk. 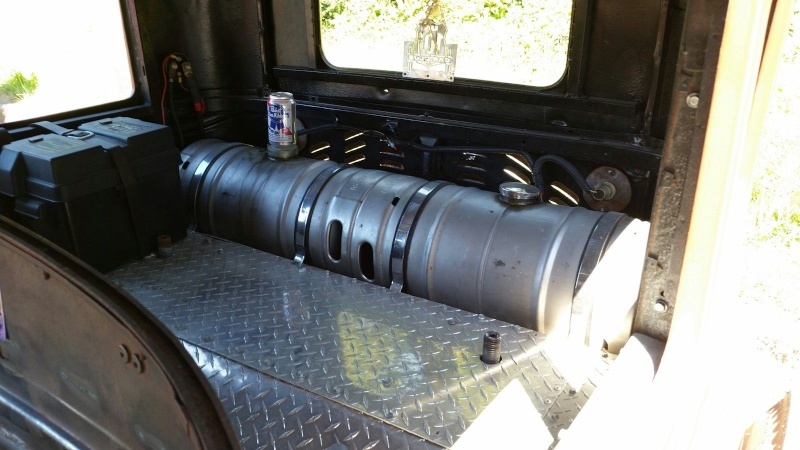 It makes the trunk too heavy so instead I made 2″ thick dense foam. I put a square piece of rubber on it, pushed in the corners and shoved it up in there. Then I smoothed around each corner. All the carpet is Mercedes Benz. 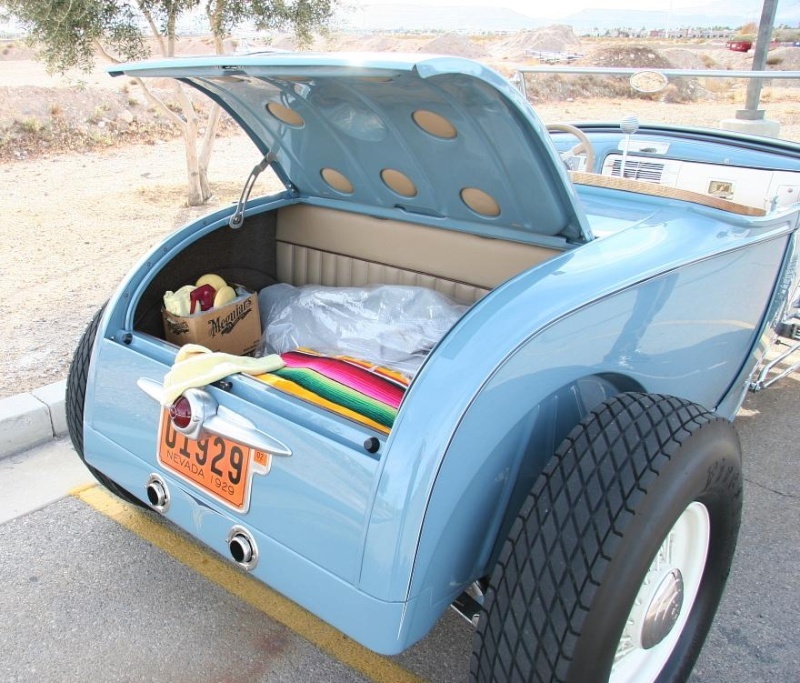 I finished off the trunk in a way that would be usable but still look very good at the show. 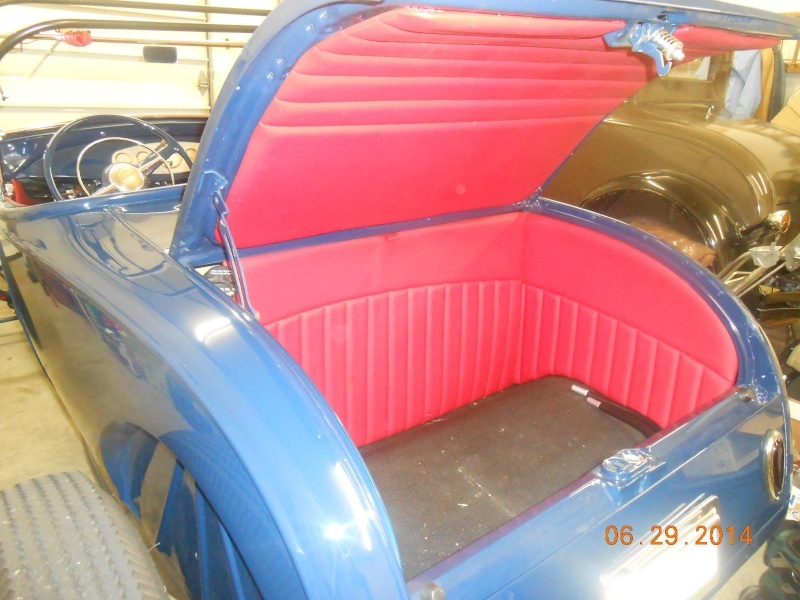 The coolest thing about the trunk is that the gas tank runs longways. 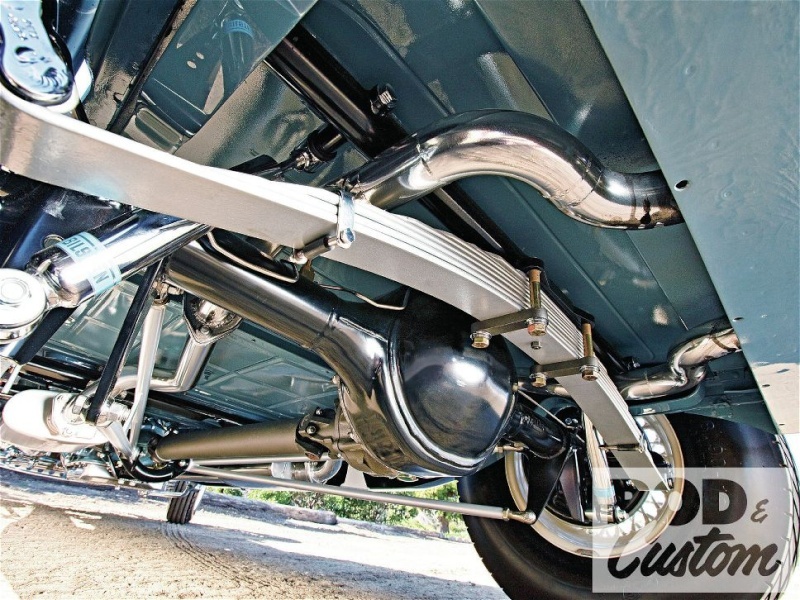 Mondo and Victor custom built the gas tank to leave just enough room for a battery that was stood up on its side. All that is hidden. 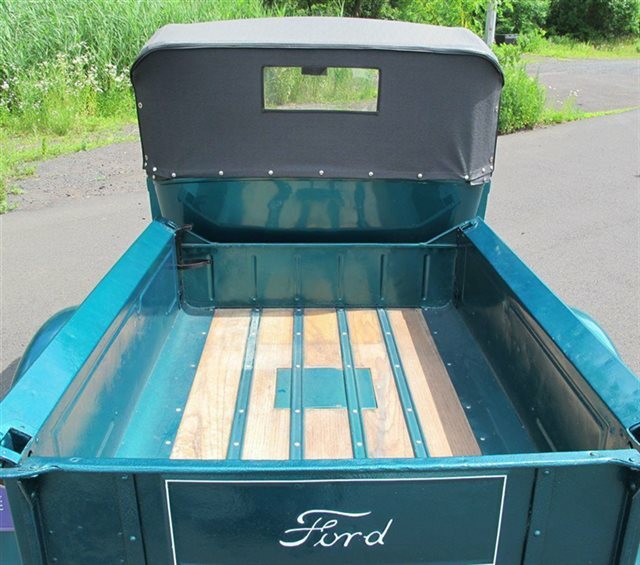 Most guys put their gas tank and battery in the trunk which leaves no trunk space. I can put suitcases in mine and go cruising. 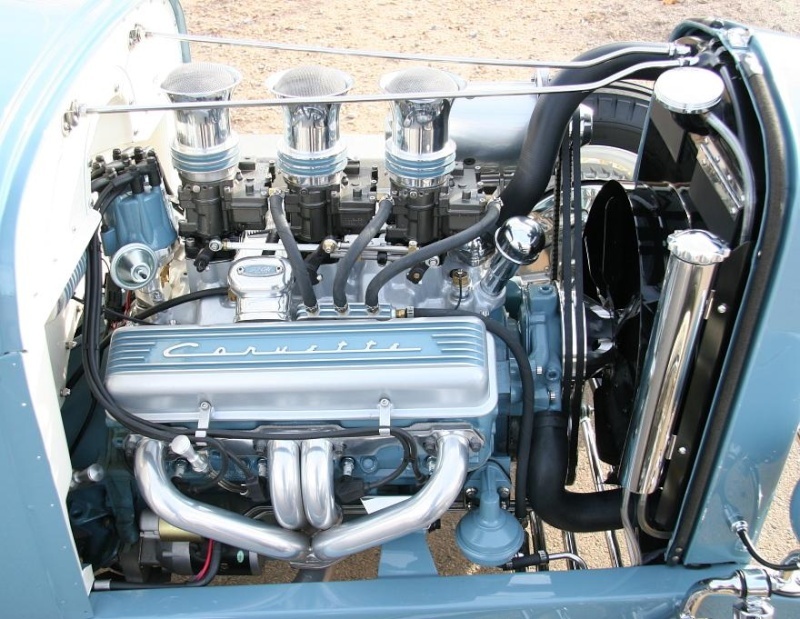 As far as the engine goes, I wanted a flathead in the worst way. But that’s when the economy tanked 3 or 4 years ago and I had to go a different route. This 3-2 system you see in here was one I had for 5 years in a wooden crate. I originally bought it for my other car, Blackie. 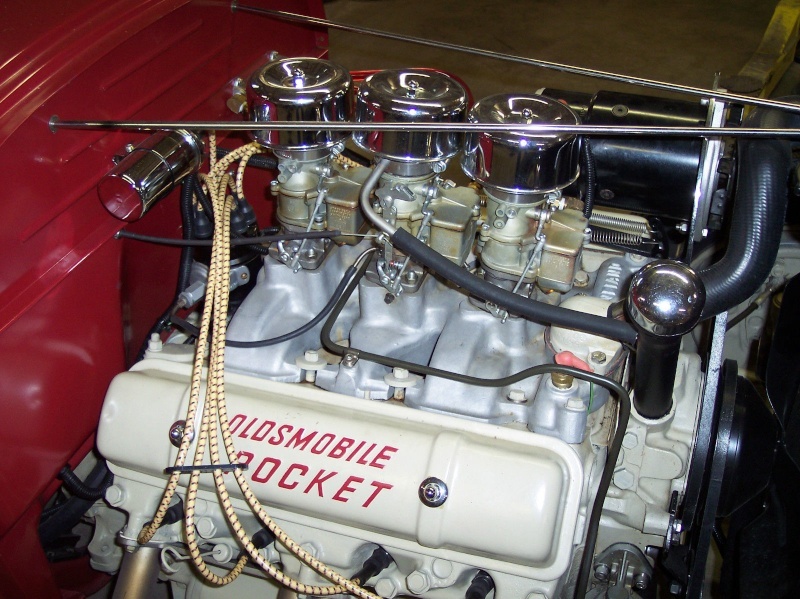 But I couldn’t use it on Blackie and the flathead I wanted cost $15,000. 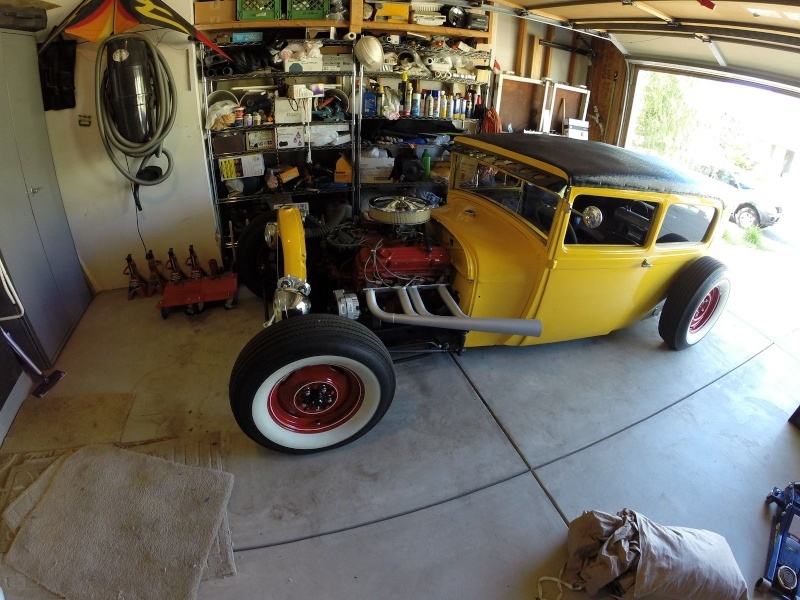 So I took this 3-2 system out of the crate, completely overhauled it and put it on this car. 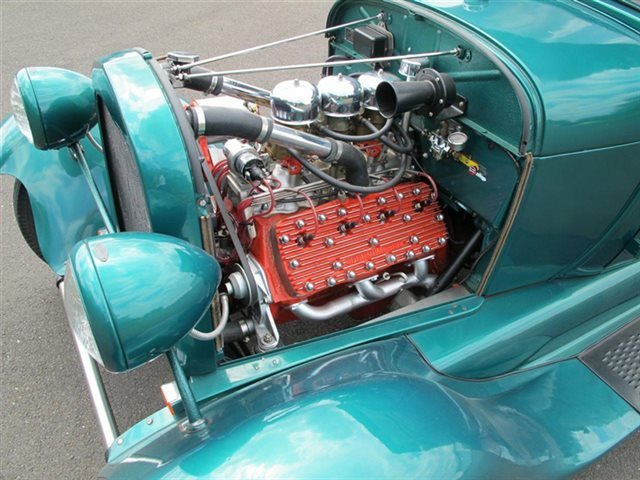 I used all old school parts on it such as Corvette original valve covers. What’s normally an oil drop was flipped upside down and drilled out so I could route my PCV valve in there. The hose comes out the back so it’s completely hidden. The generator is a generator outside but inside it’s a 100-amp alternator like the 2012 cars have. So it all looks old school but it’s still modern technology which was important. I made the coil and air cleaners in matching styles and everything on the radiator is hand made. 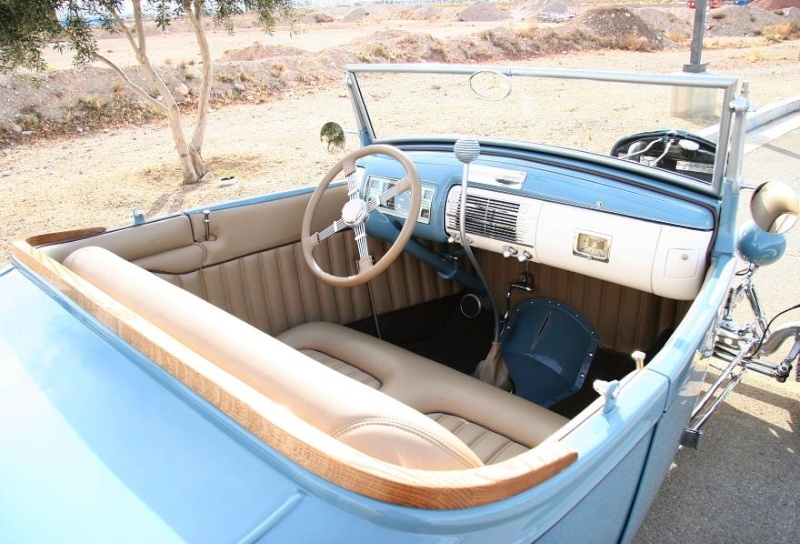 What people like about this car is its simplicity. And the color kills people. Everyone told me not to use this color. I had been dreaming about having a car in this color since I was a kid so I knew it was going to work. 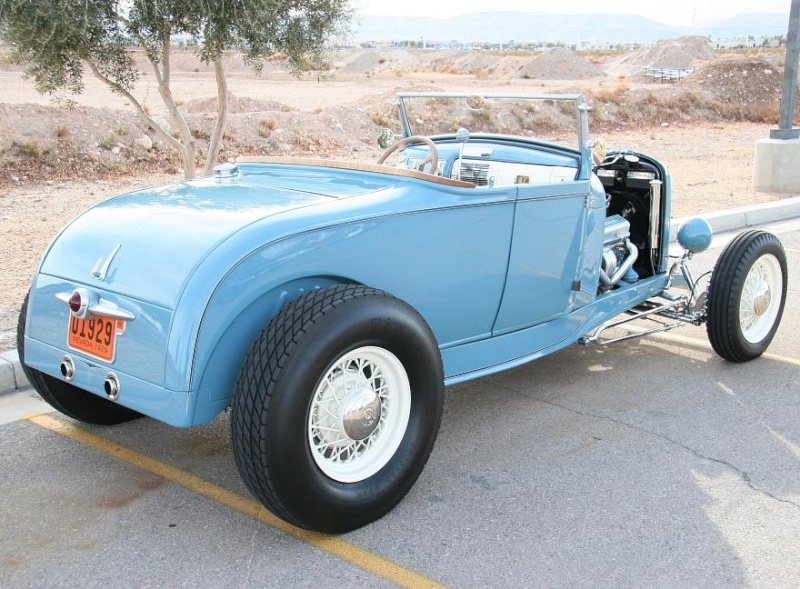 What made it work was the Wimbledon White which is a cream color on the firewall and the matching wheels. It all blends together. Let’s not forget Johnny Venturino who did the wood. He has built guitars and violins. 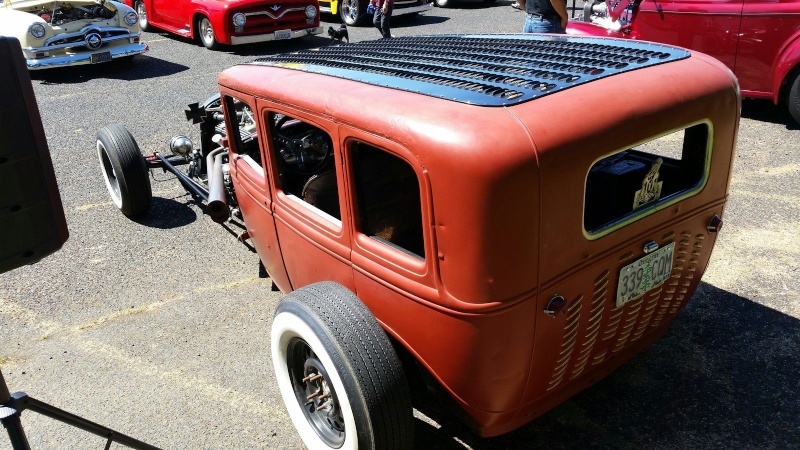 He made that wood in one piece and it gets a lot of attention. 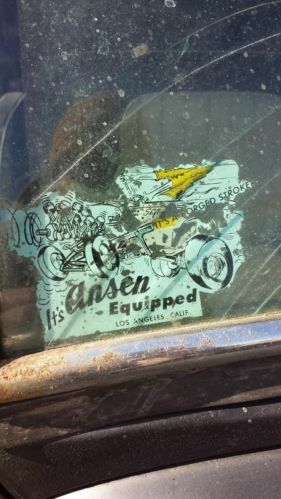 This is one of the rarest windshields out there. 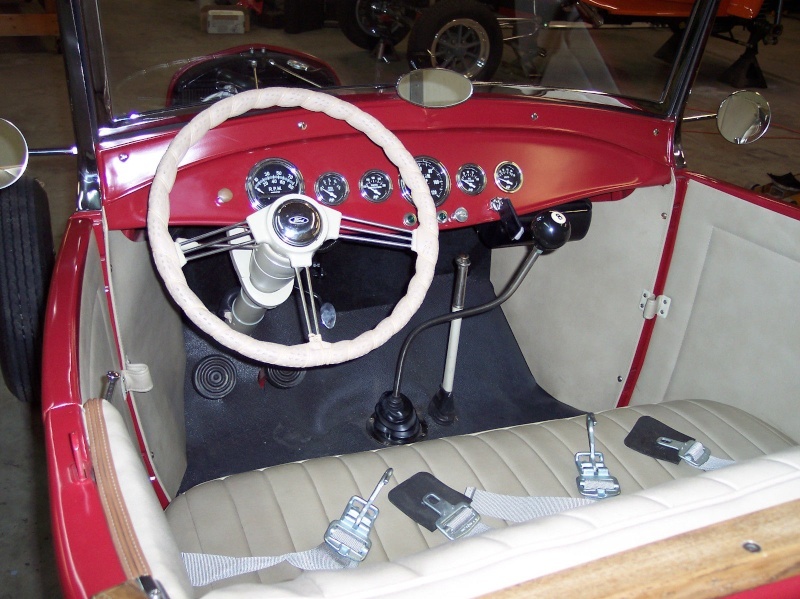 The ’29, ’30 and ’31 came with a windshield that did not lay down. This windshield lays down. 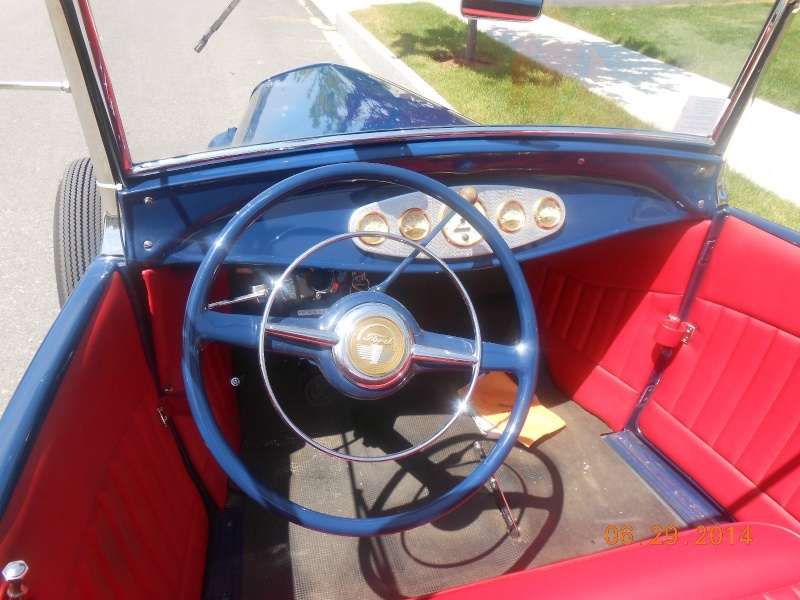 This is a ’40 dash, all original, all correct. 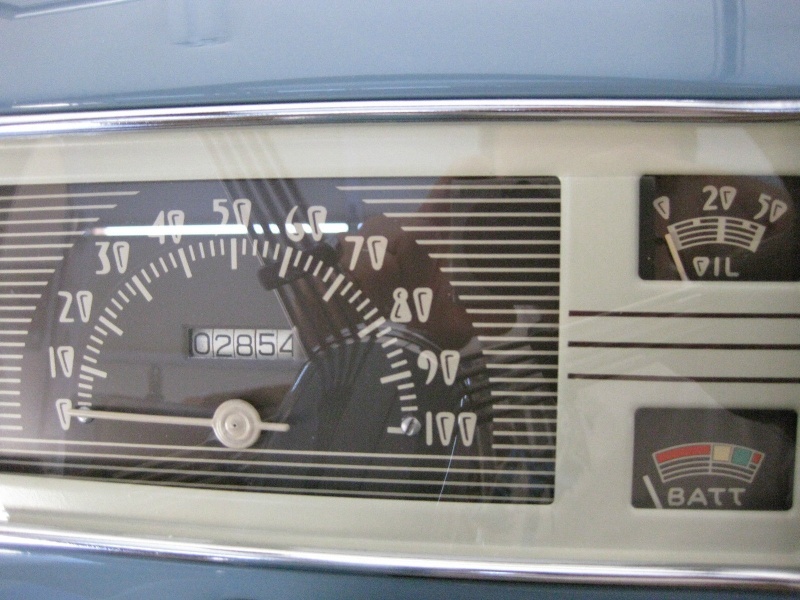 It has the original gauges and the original clock and radio. 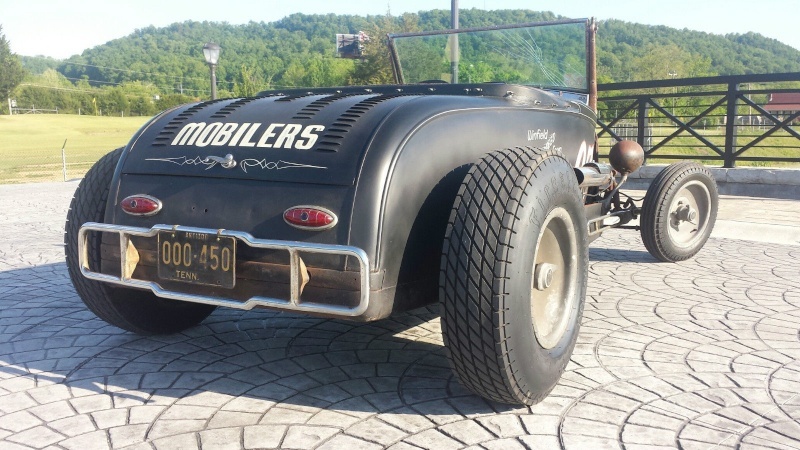 Mondo and Victor modified it to fit into a ’29 roadster. 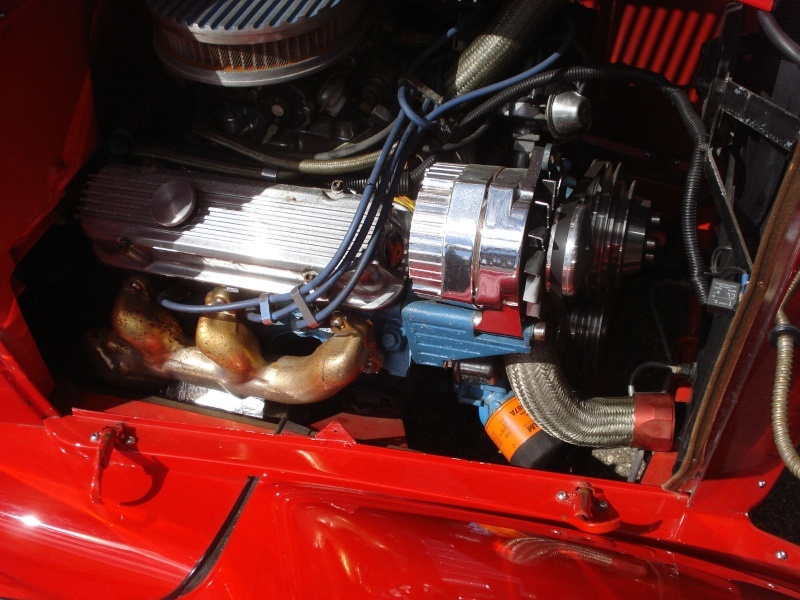 The transmission cover is also custom made. 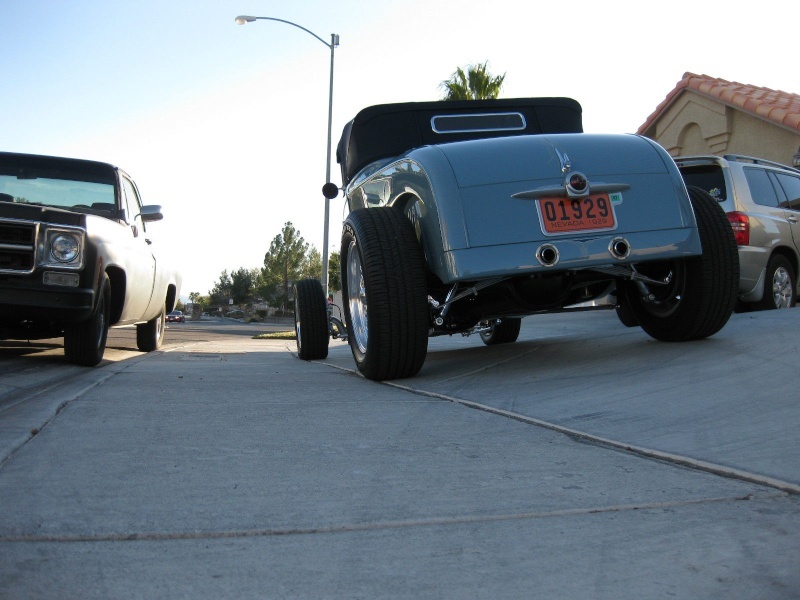 The back of that curve came off of a Ford 9″ rear end cover. We sliced it down the middle and used the back end of it. 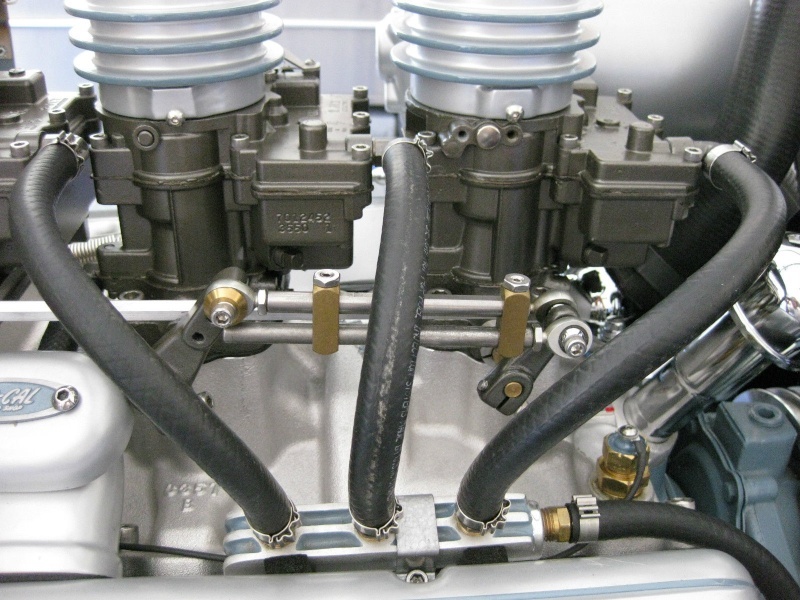 Then, the curved piece that the distributor goes behind was made from the other half of it. This car has defied all the odds. 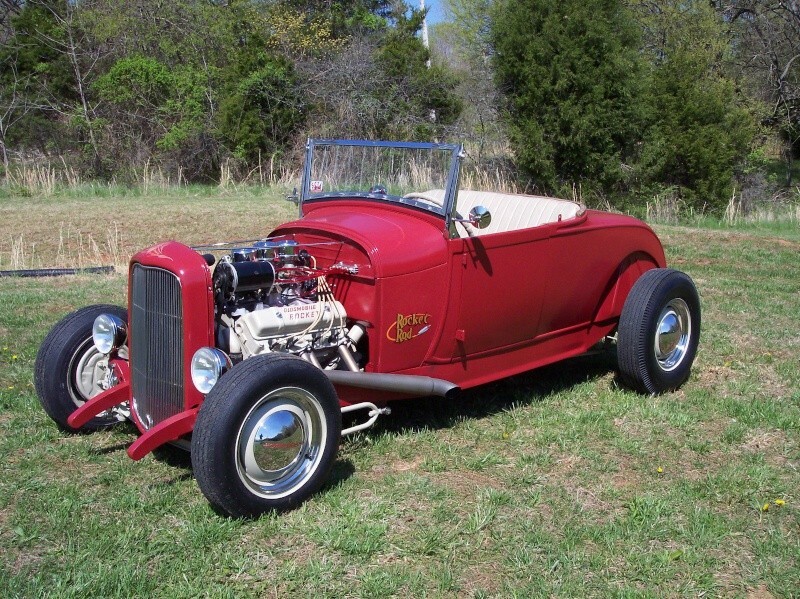 It's the ultimate survivor Hot Rod available on the market today. 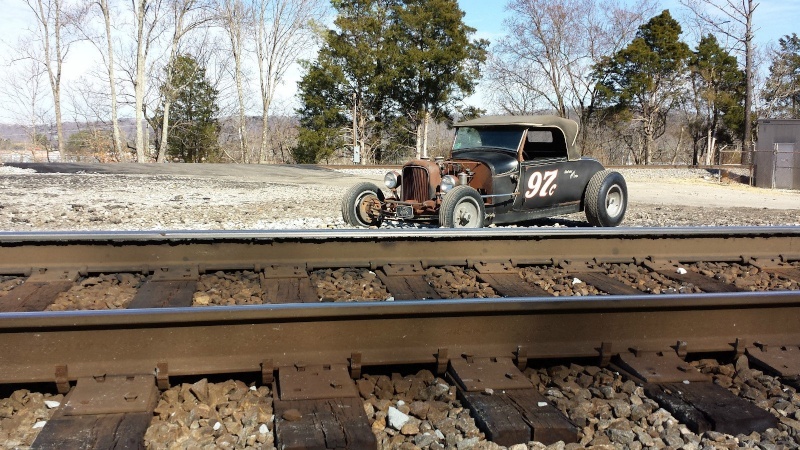 This car has documented racing history back to the early '40's. It is as found around 15 years ago in a barn in Sparta, Michigan. Basically returned to it's former glory as a racecar. 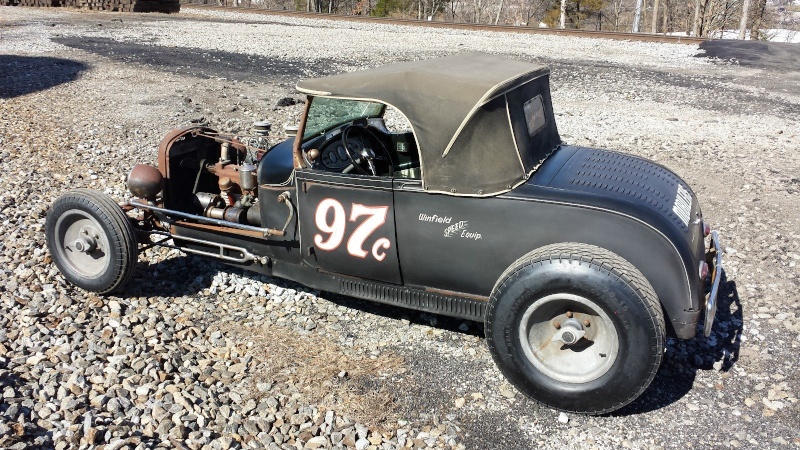 Early '50's dirt, circle track, racecar that luckily survived. 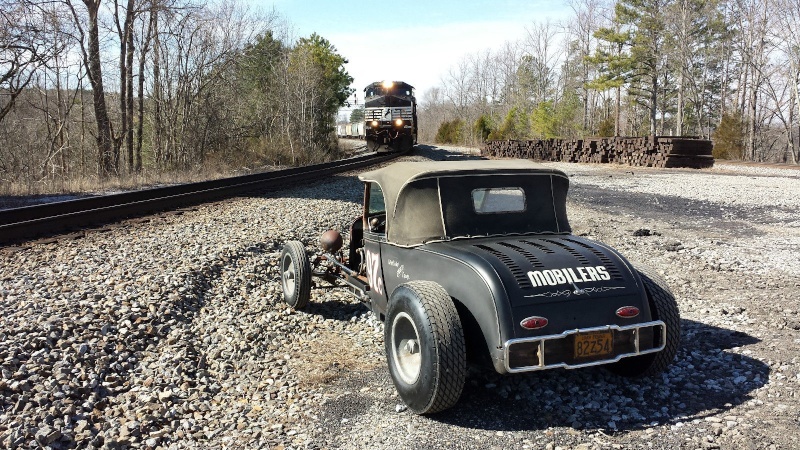 Nick Hardy found and restored this car as it was over 60 years ago. All the OLD chrome still remains as it was. Absolutely nothing has been updated other than the tail lights. 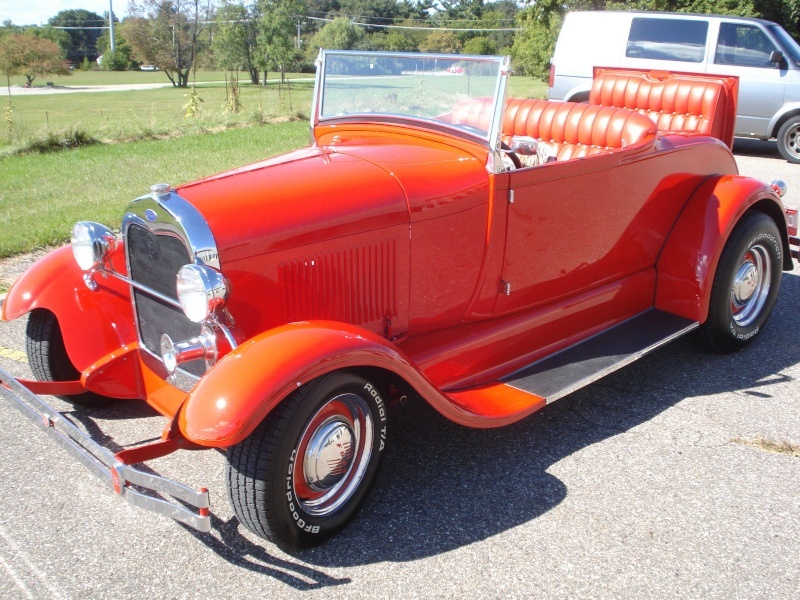 Real deal 1929 Ford Roadster that the passengers door was leaded closed over 60 years ago. 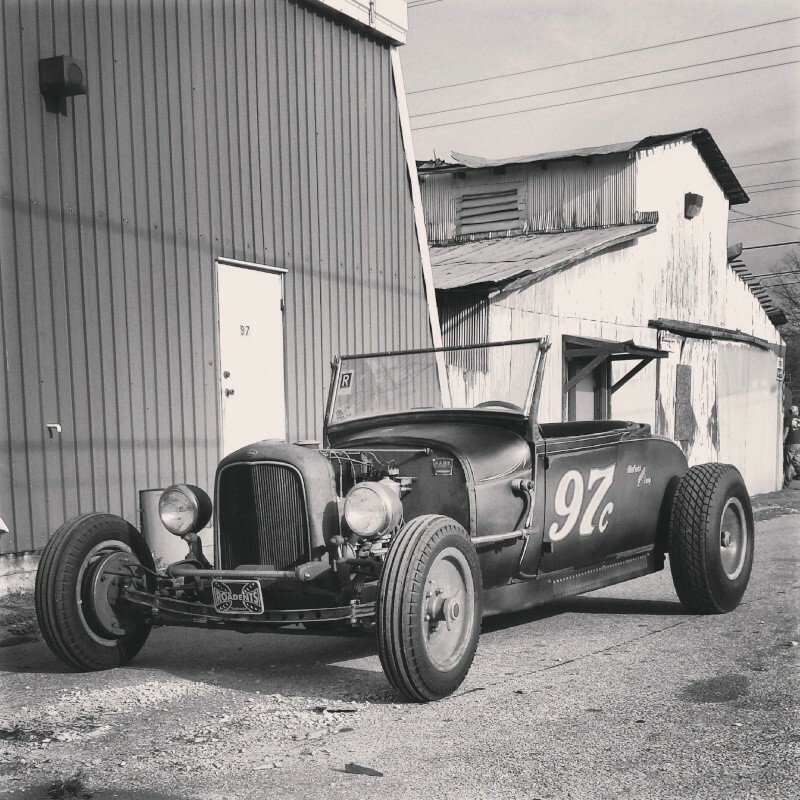 Always been a Winfield Ford Banger powered Hot Rod. 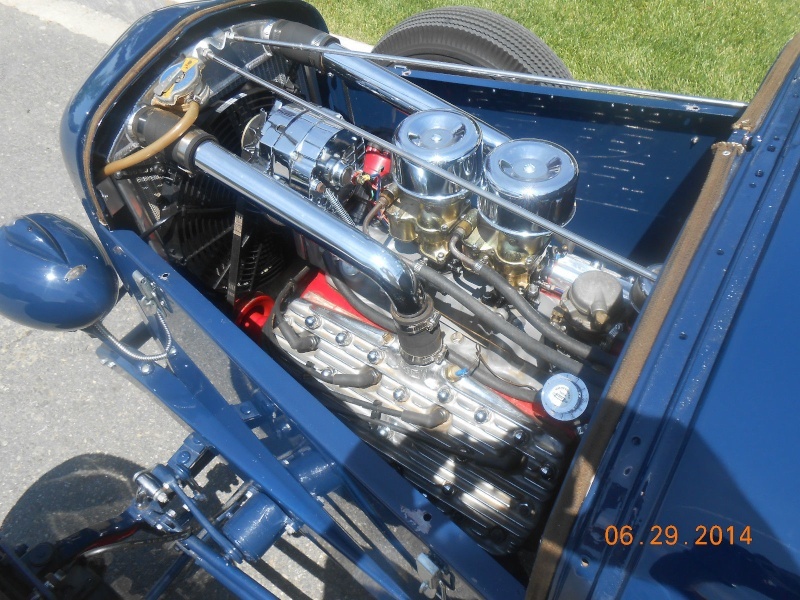 The engine is a 80 over Model A with a Vintage Winfield head, 2x2 Stromberg 81's. 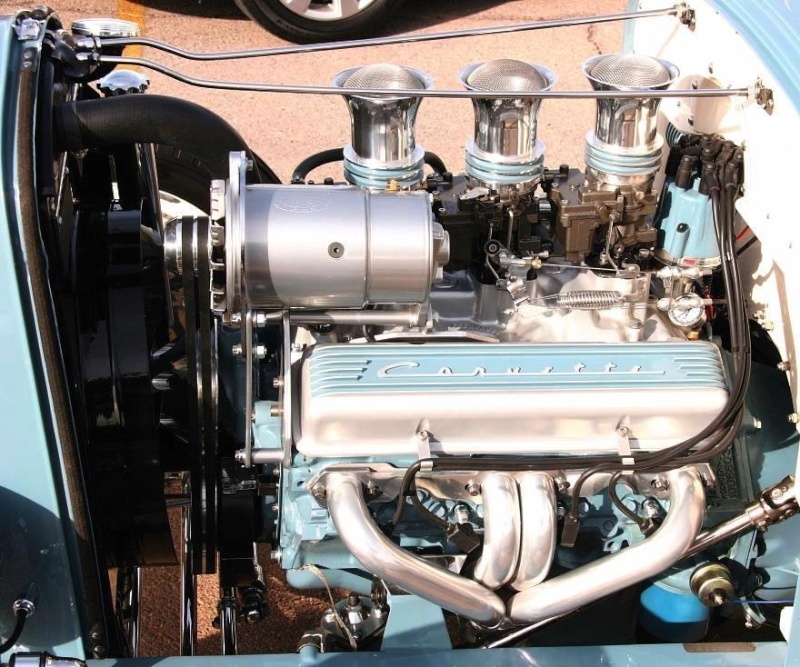 '30's Indycar header and a BIG cam. Mallory distributor and all vintage Speed Parts. 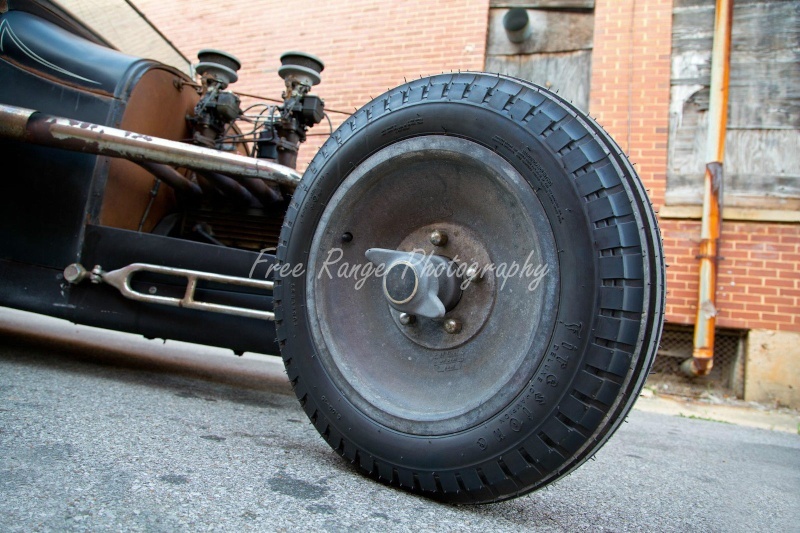 Model A drivetrain.Super RARE Halibrand SMOOTH magnesium wheels with BRAND new Coker vintage dirt track tires. 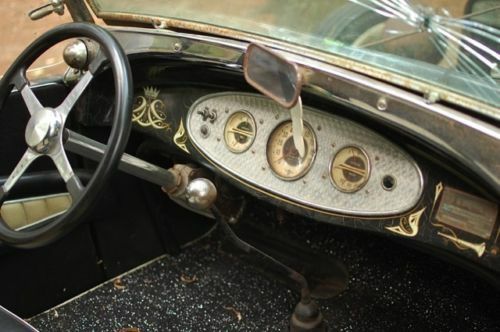 Perfect vintage black and white interior with a 30's dash. 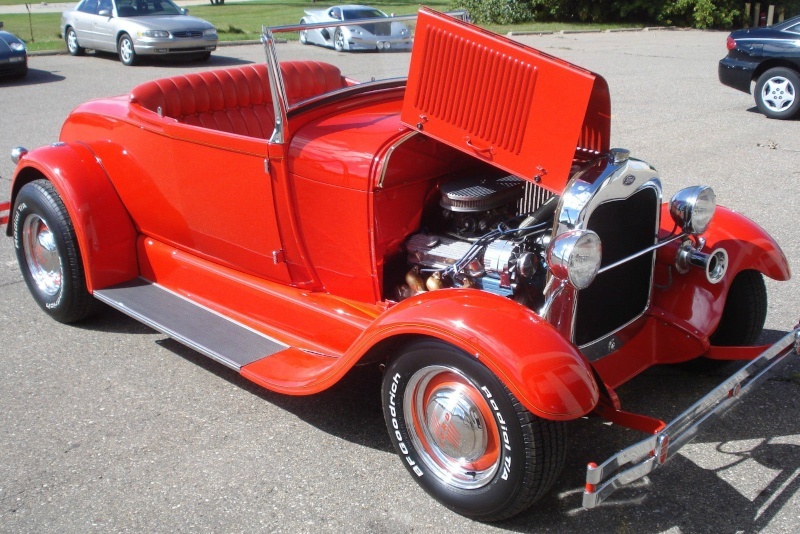 1928 Ford Pickup Hot Rod, built like it was 1960 using period parts and methods. 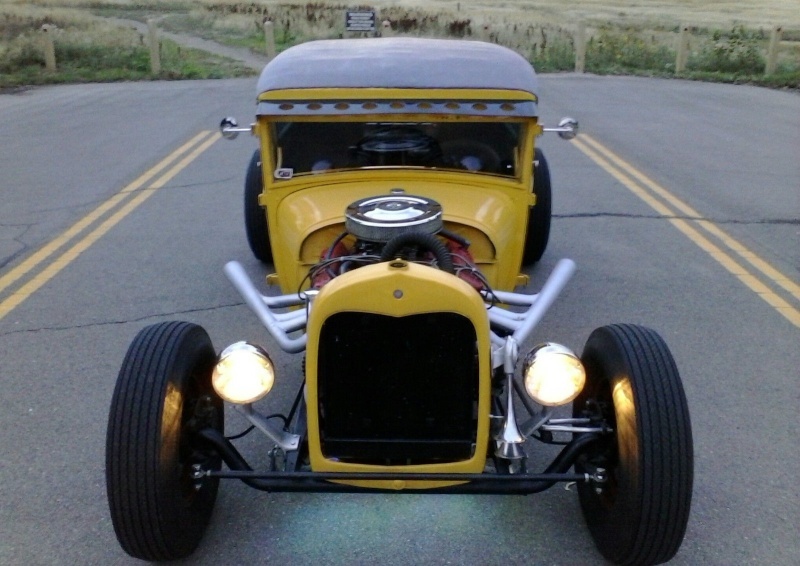 Car is built with all vintage parts, extremely period perfect, 85% old chrome. Car has only been on road since November, under 1,000 miles driven. 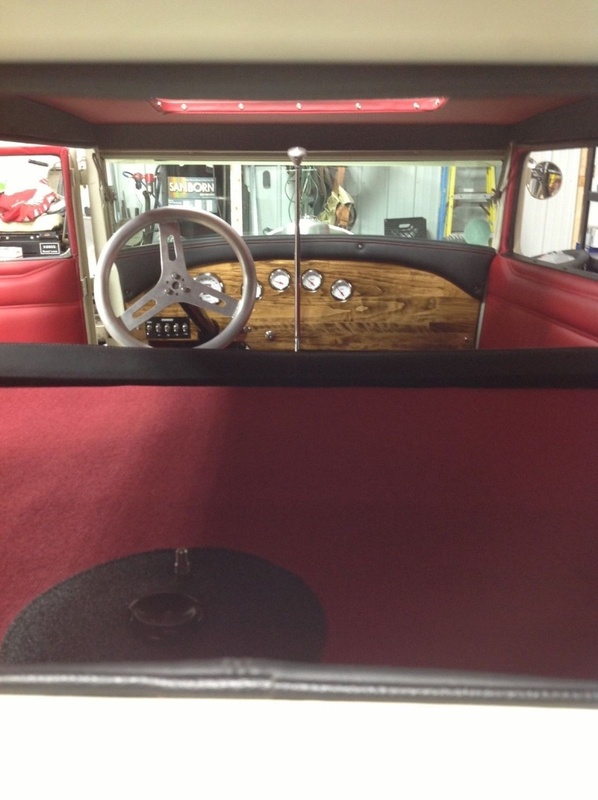 Cab rebuilt, new wood and panels, channeled 7 inches, unchopped. Bed built from original and handmade parts. 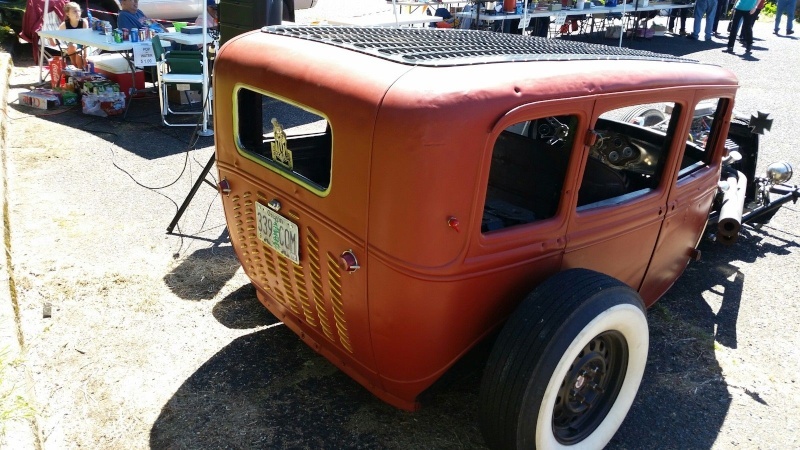 32 grill shell housing brand new aluminum radiator. All needing minor body work for final paint. 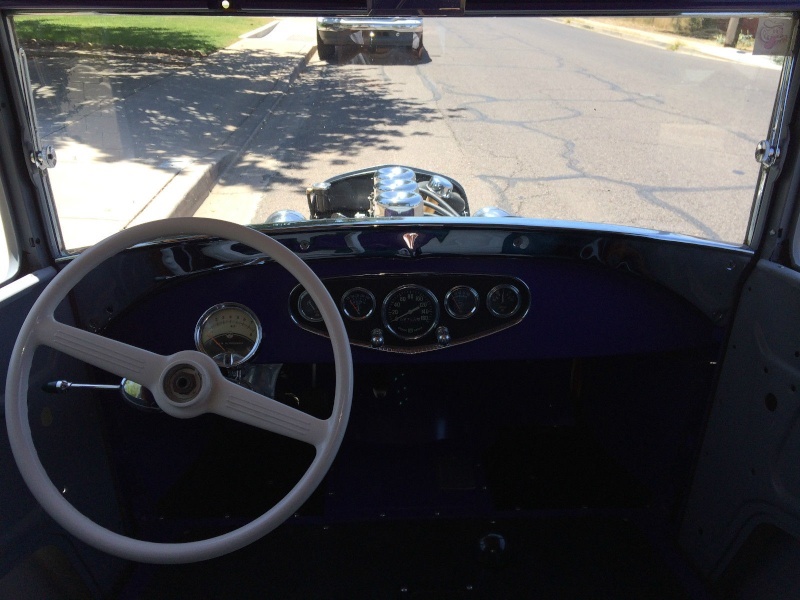 Interior and firewall are painted purple. 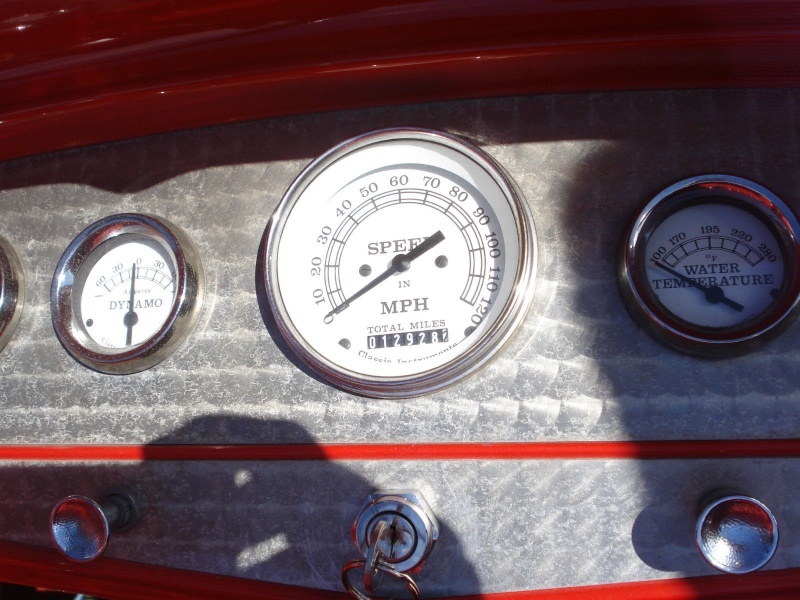 Chrome dash panel, Stewart Warner gauge cluster, full set vintage SW gauges, chrome 34 Ford steering, with vacuum tube column, with Moon column drop and NOS Sheller bakelite steering wheel. 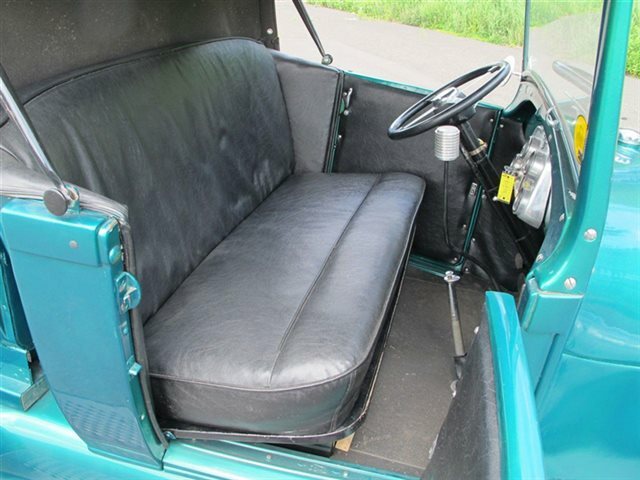 Cab has sturdy roll bar. 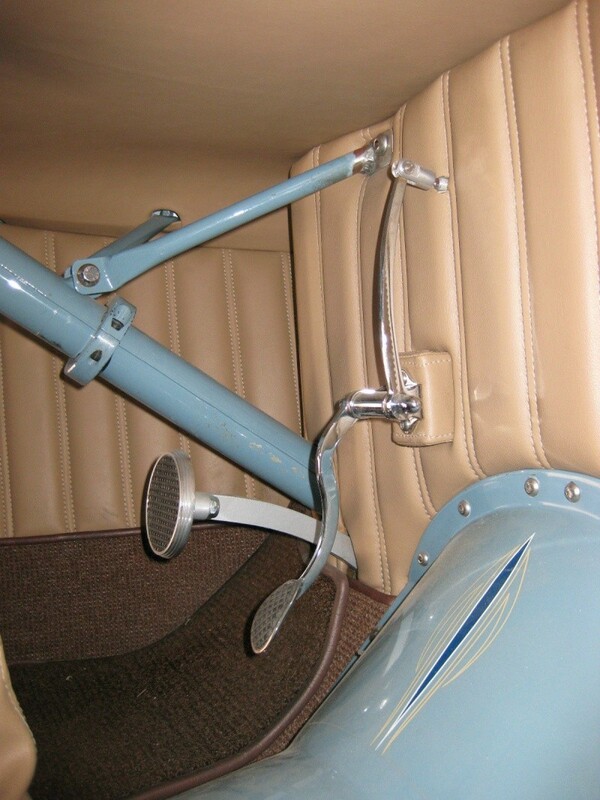 Original Model A frame, boxed, with sturdy X member. 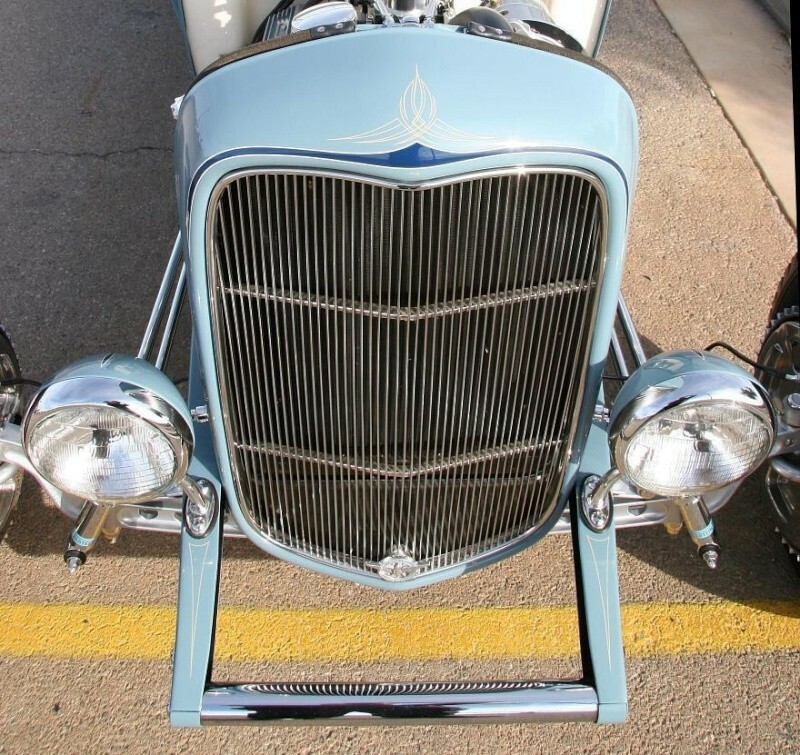 Chromed front end which includes, 33 Ford axle, spring, 32 Ford wishbones. 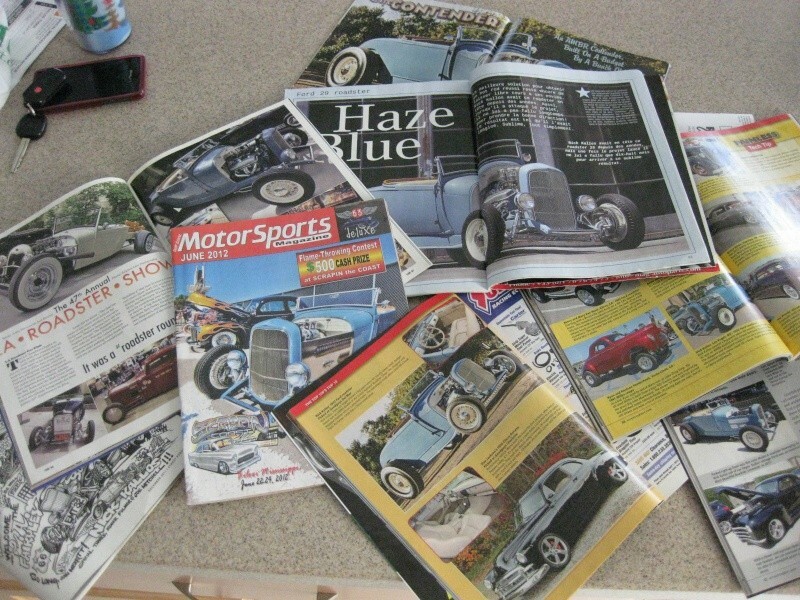 42 Ford brakes all around, baking plates chromes. 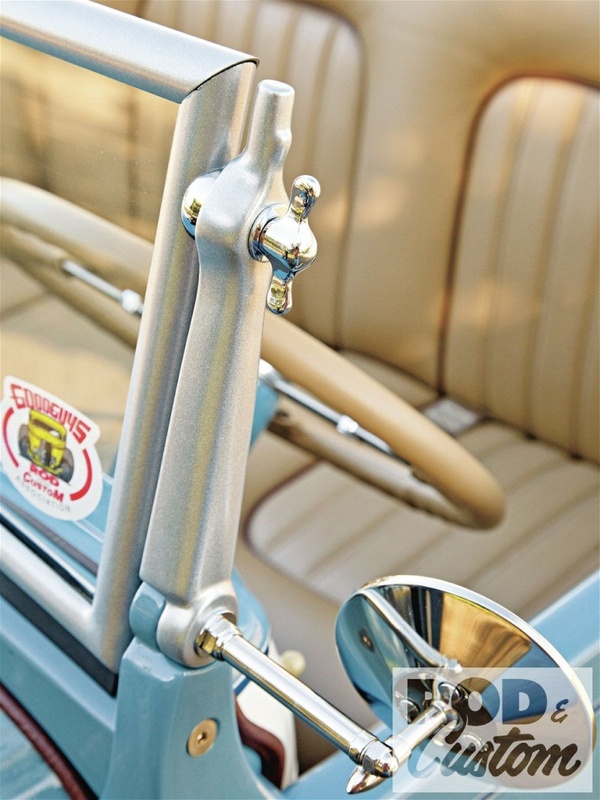 1960 chromed Oldsmobile master cylinder, stops great. 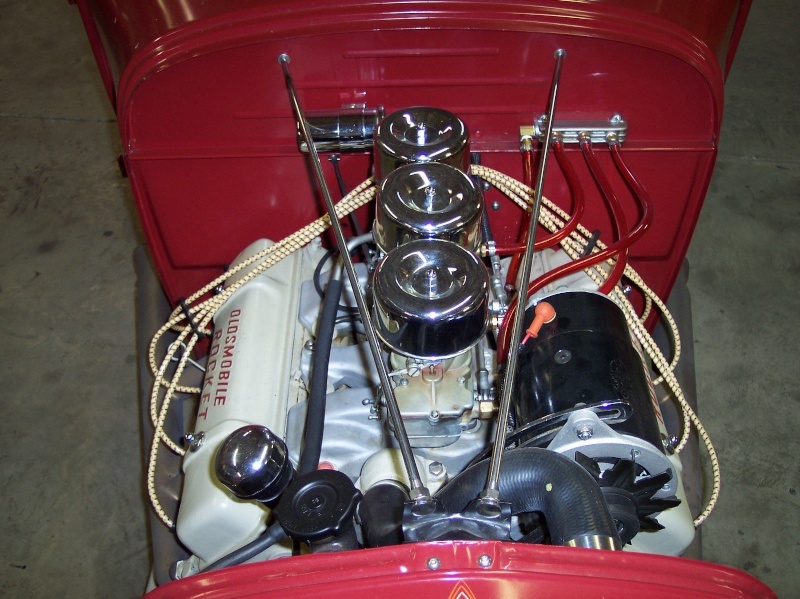 1942 Ford rear end professionally rebuilt, chromed center section, chromed model A spring, 42 Ford wishbones, with a torque arm. 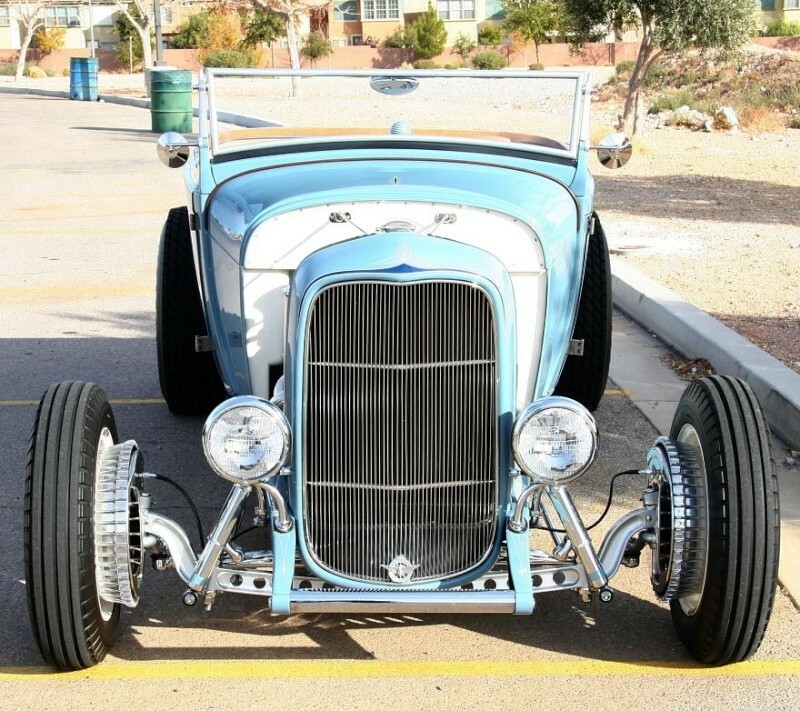 15" Ford F-1 rims with Cal-Custom Beanie Caps. 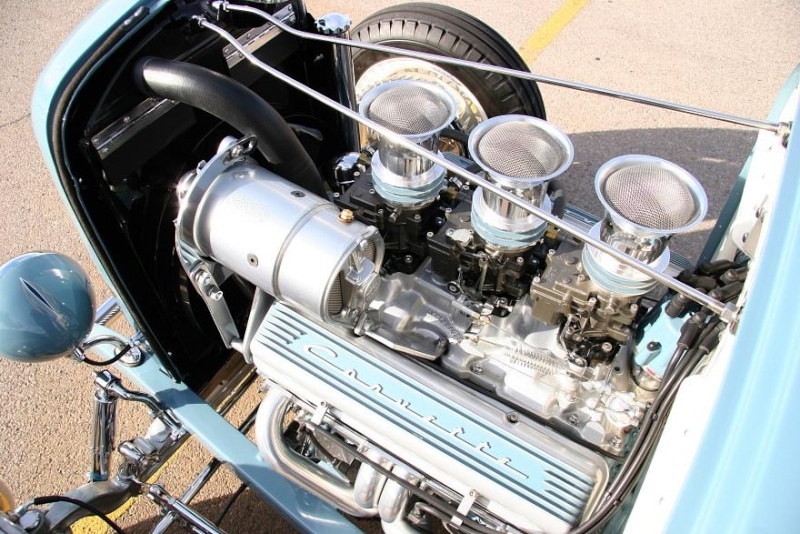 1957 Oldsmobile 371, bored to 394, professionally rebuilt with Ross Racing custom forged pistons, full race Isky cam, hardened seats, Chevy valves, J-2 tripower carbs with progressive linkage on an Offenhauser intake, old chromed headers. 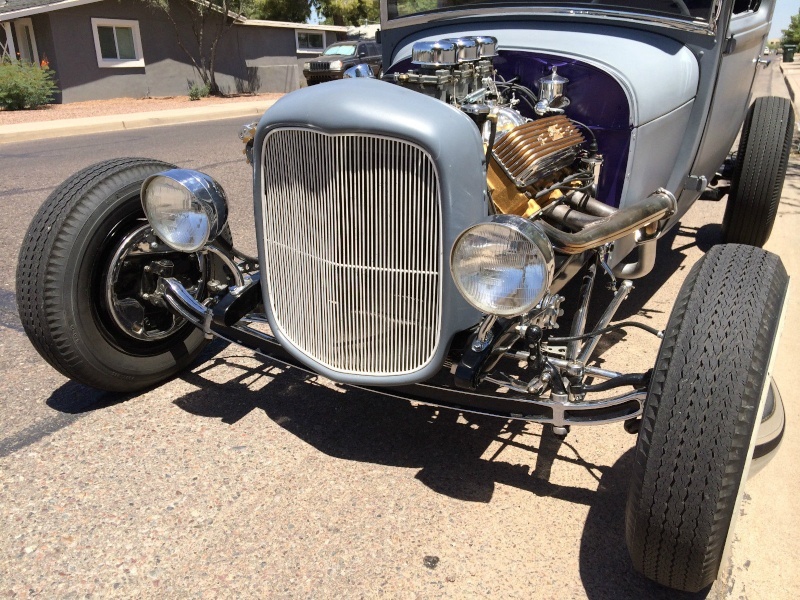 Runs perfectly, lots of chrome, looks awesome!! 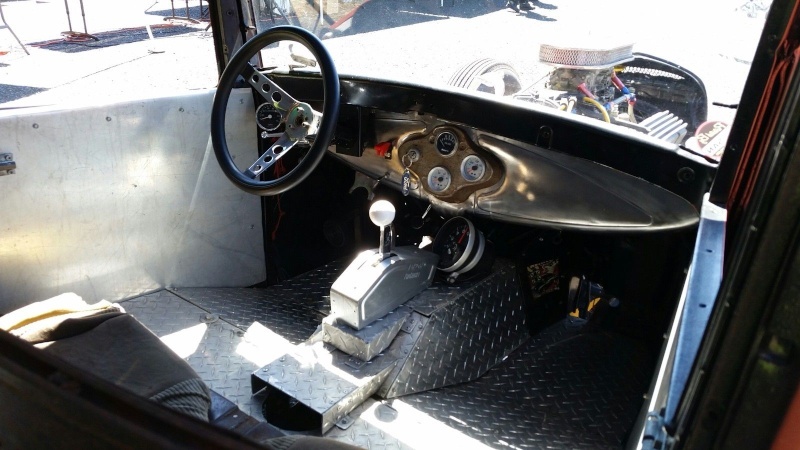 Rebuilt 1953 Oldsmobile slant pan hydramatic trans, modified for dragging, Ansen Econo-Shifter. 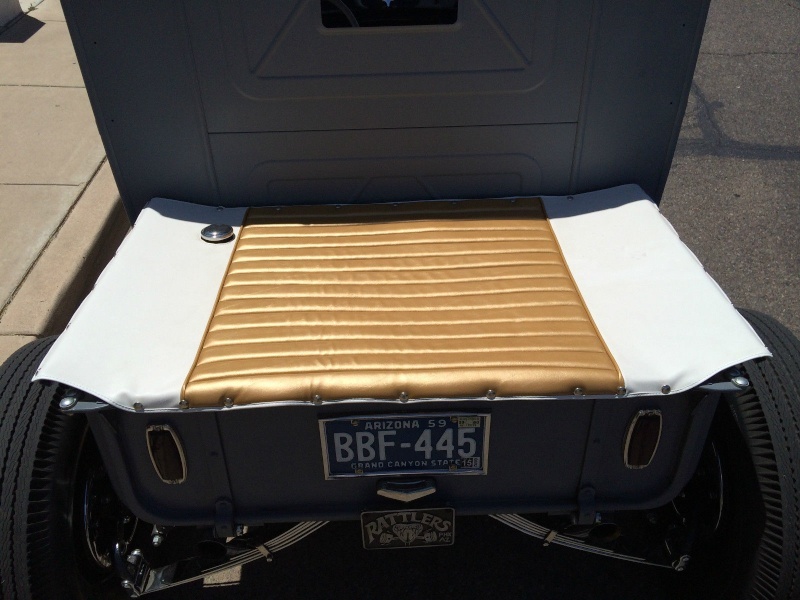 Brand new White and Gold tuck and roll top and tonneau cover, really nice. 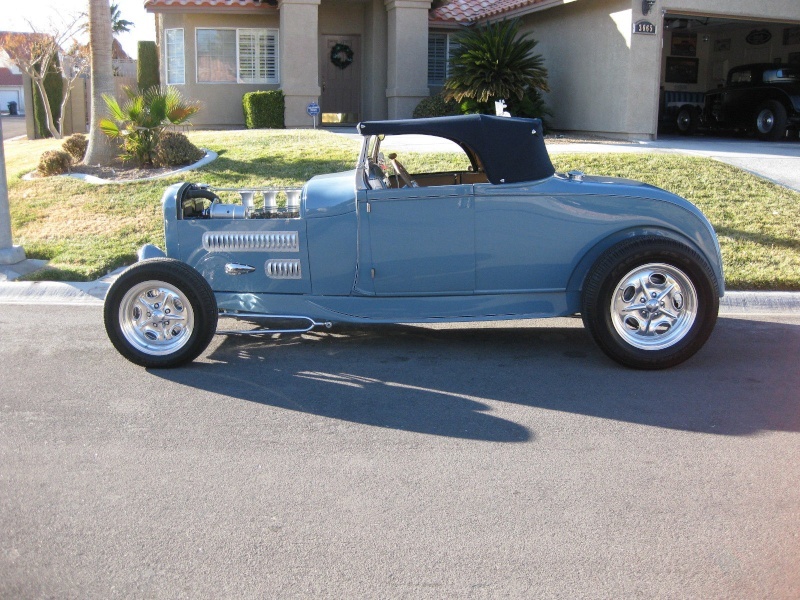 The car was built in California by pro builder Jordan Graham as a period correct 50s-60s era hot rod. 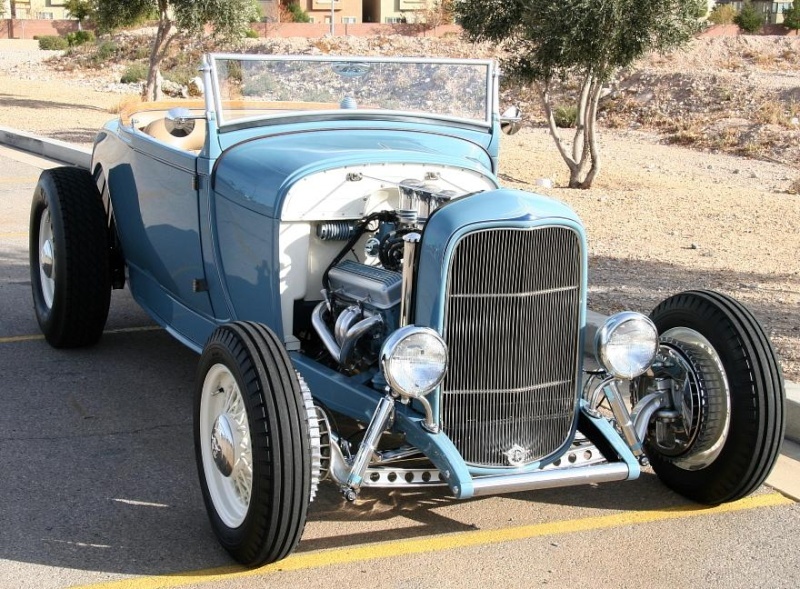 He was contracted by Dupli-Color to build the car for their "Paint Shop Restoration Series" and when the car was completed, it was featured at SEMA 2012. 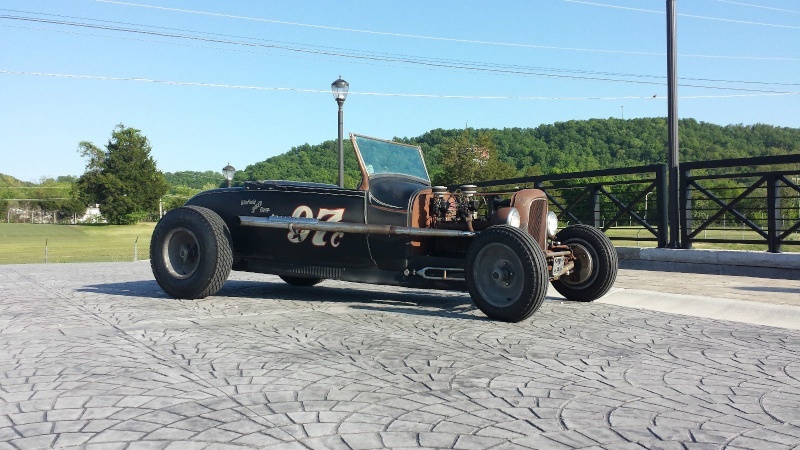 This car was built the old school way using all old or NOS parts on the body. 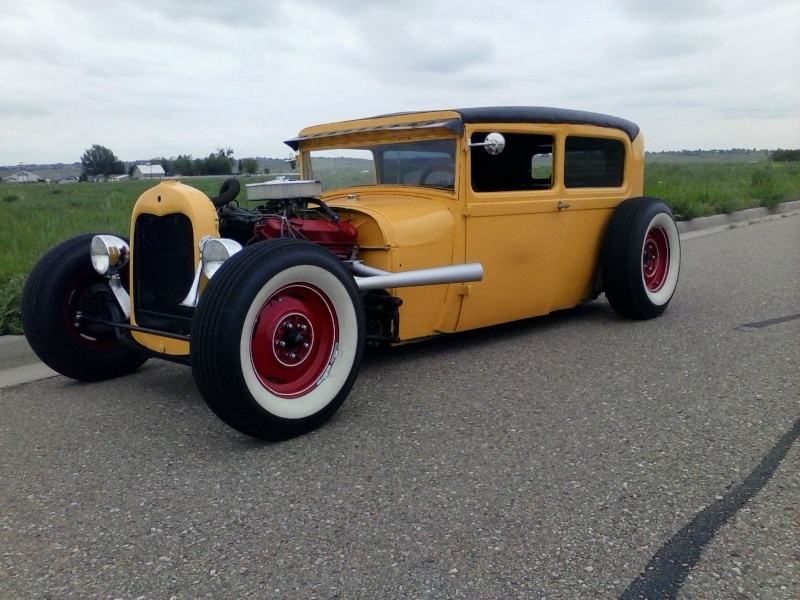 Body: Real 29 ford, 32 ford grill, 5" chopped tilt windshield with stainless posts, 35 ford dash with glove box, 50 Pontiac tail lights, 28 fluted Model A headlights with integrated running lights. 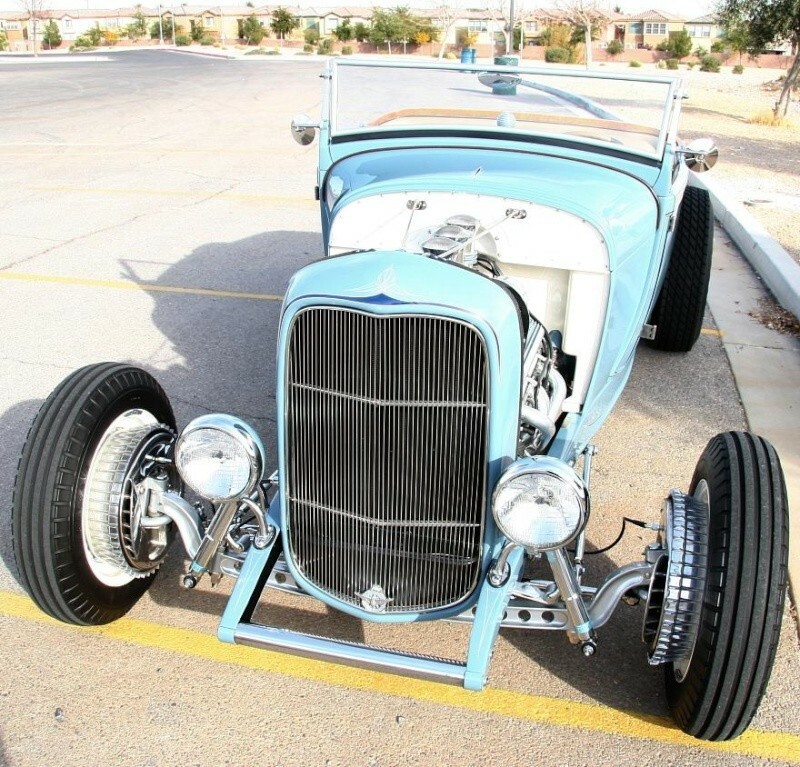 Frame: 1932 Ford Squeak Bell with boxed rails, Model A cross member, Chassis Engineering X-member, ladder bar rear suspension. 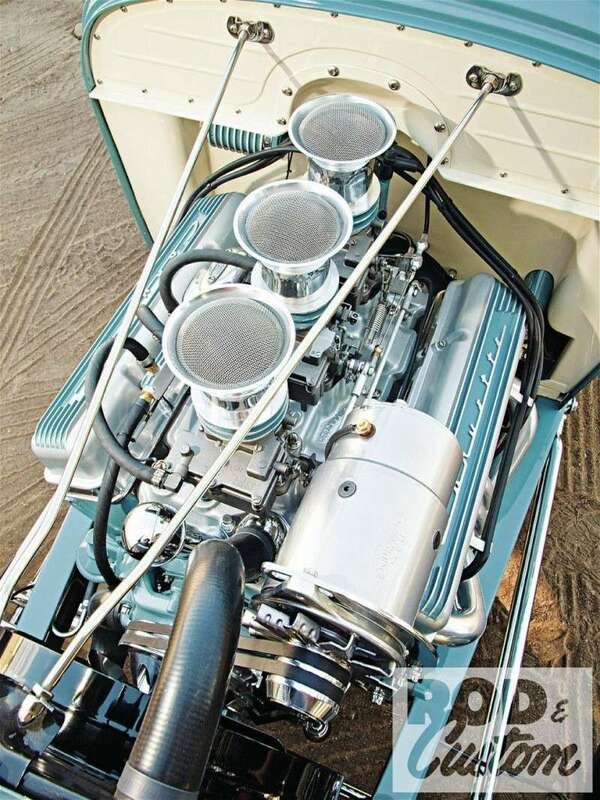 Drivetrain: 1969 "010" 4 bolt main 350 small block built by NHRA legend Bob Joehnck of Santa Barbara CA, steel crank, 10:1 Keith Black pistons, Duntov 30-30 cam, roller rockers, decked block, progressive 3x2 intake and carb setup, sounds awesome through the vintage 60's style Gear Drive lake headers with integrated mufflers and turnouts, reliable and runs cool all day long at 170 degrees! 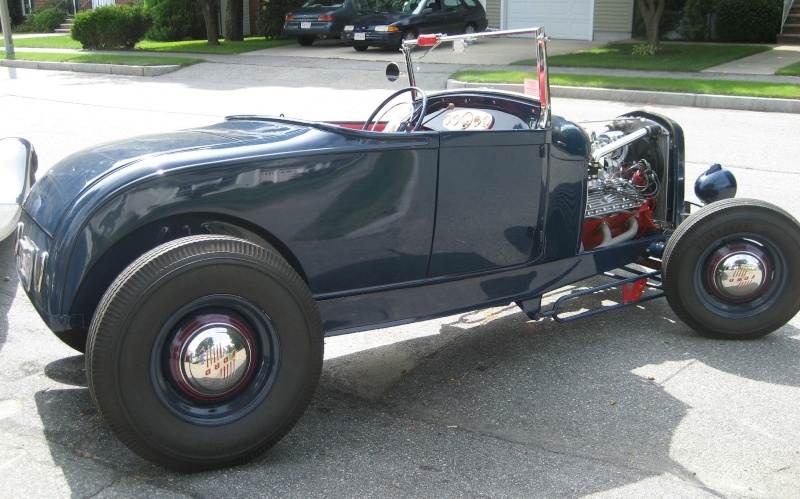 Backed by a vintage B&M TH350 3 speed auto trans that was completely rebuilt as well and 9" Ford rear end. 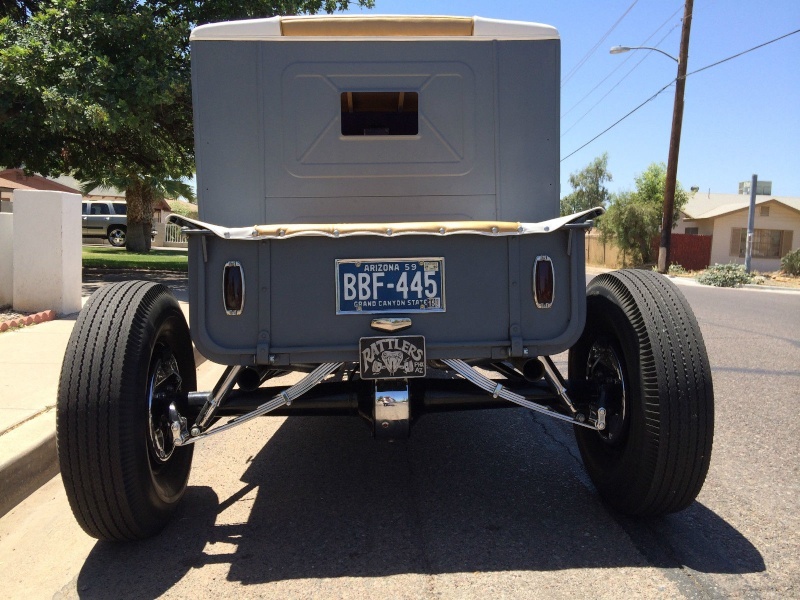 Vintage Ford 4 wheel hydraulic drum brakes, period 16" steel wheels with Ford V8 caps and brand new bias ply tires. 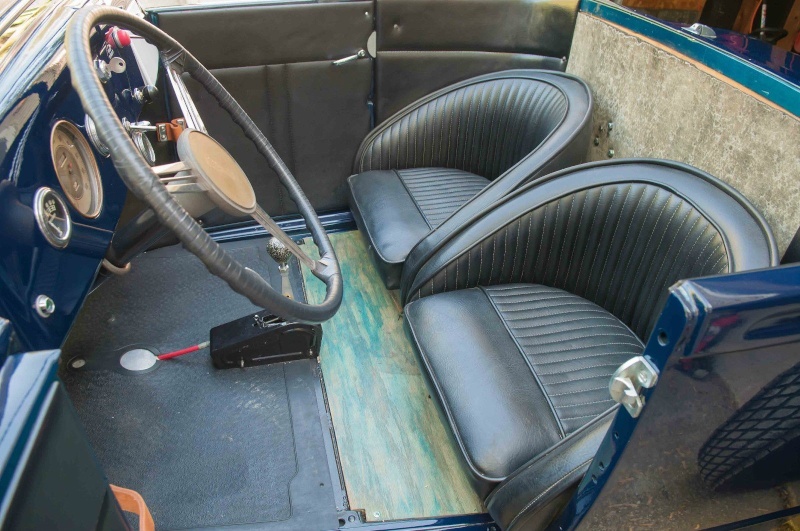 Interior: Vintage side panels and pleated 60s bucket seats, period correct wood floors, spoon gas pedal, 39 Ford brake pedal. This car is the real deal, not a hacked pile of crap, not a glass replica. 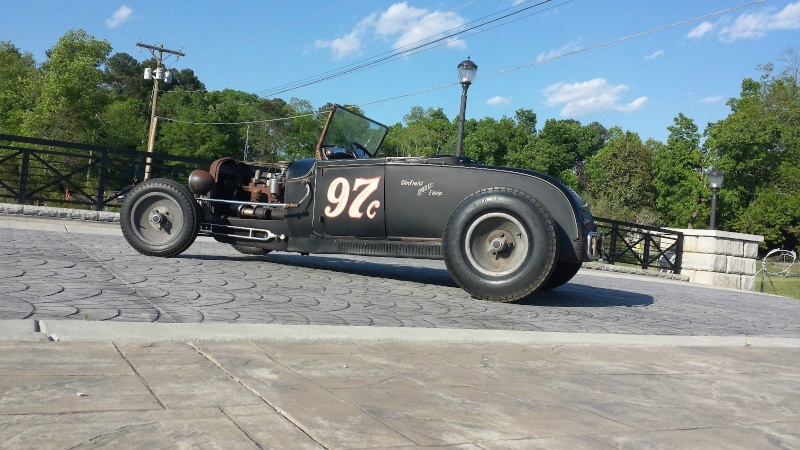 It is a real Ford steel, California black plate old school hot rod! 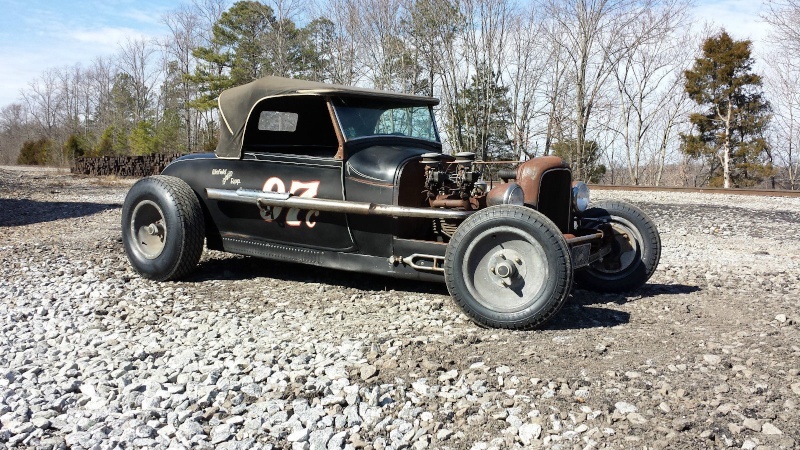 28 Ford Model A Rat/HotRod for sale. My Angelyne! I've had this ride for a few years now. I added the compressor for rear air bags (has about 4.5" of travel up and down), tank, lines, re wiring of most electrical, switch panel, police lights, air horns, aligned, balanced tires, complete rebuild of transmission, under lights, side mirrors, rear view mirror, rear glass, and more. Get in start and drive. 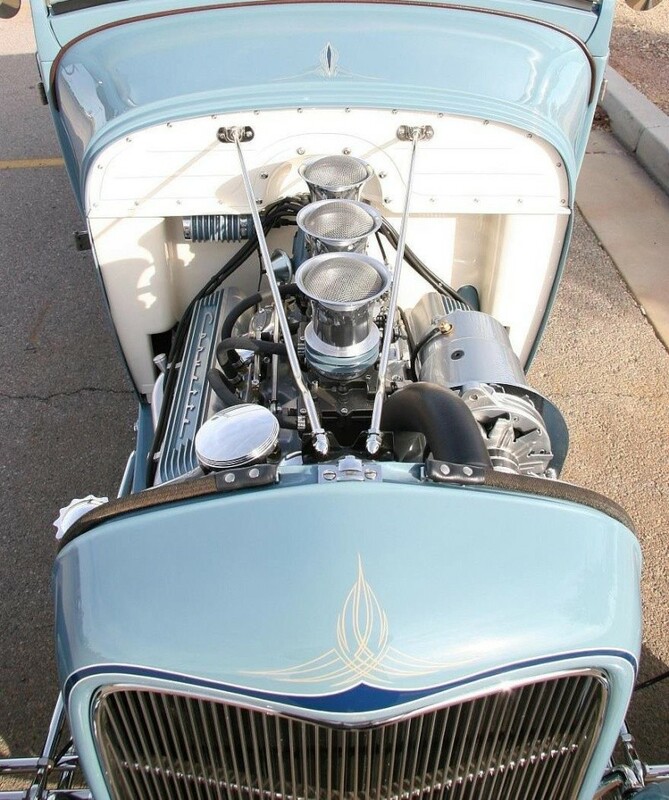 Has a 430 Buick Big block. Really nice deep sound. Strong and fast. 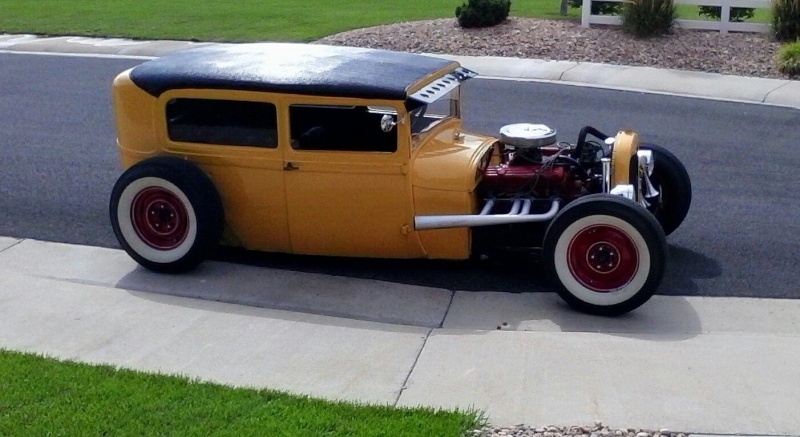 I don't need to mention the attention no matter if its sitting in the garage or driving down the road. Don't waste your time fixing someones mistakes or repairing there damage. 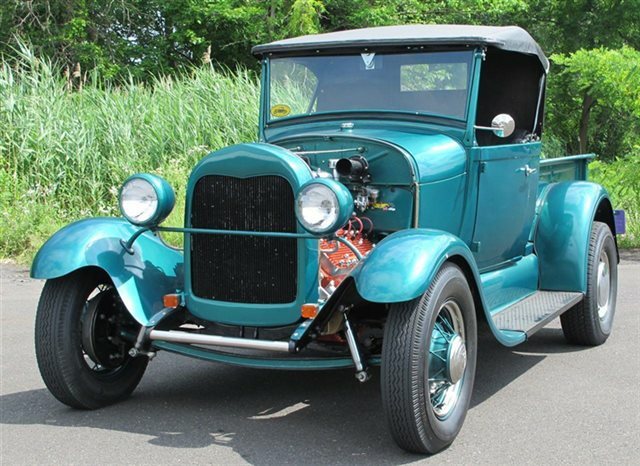 This vehicle is ready to drive and enjoy. My 15 Year old daughter has driven this vehicle many times. Real Glass with tint on both rear windows. 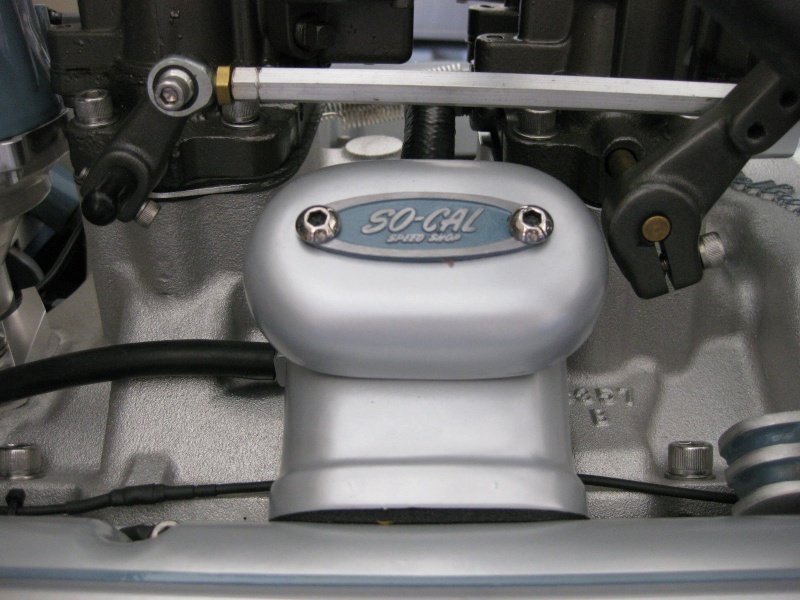 Chevy Turbo 350 Automatic Transmission. 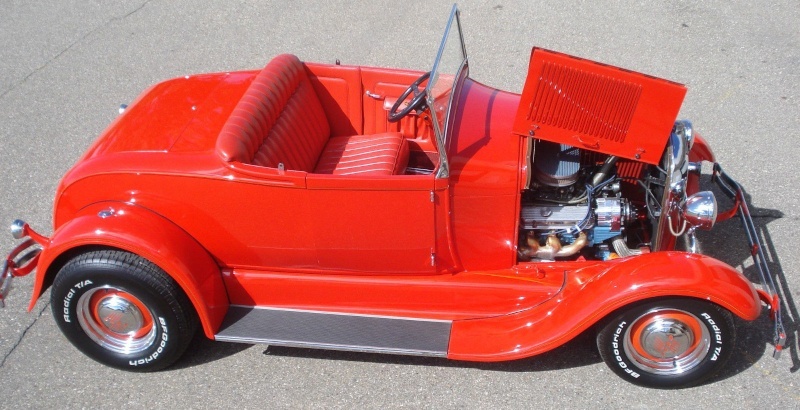 This sweet little roadster was built by John Thawley in 1982 for Buick Motor Division as a concept promotional vehicle for Buick's aftermarket performance parts display. 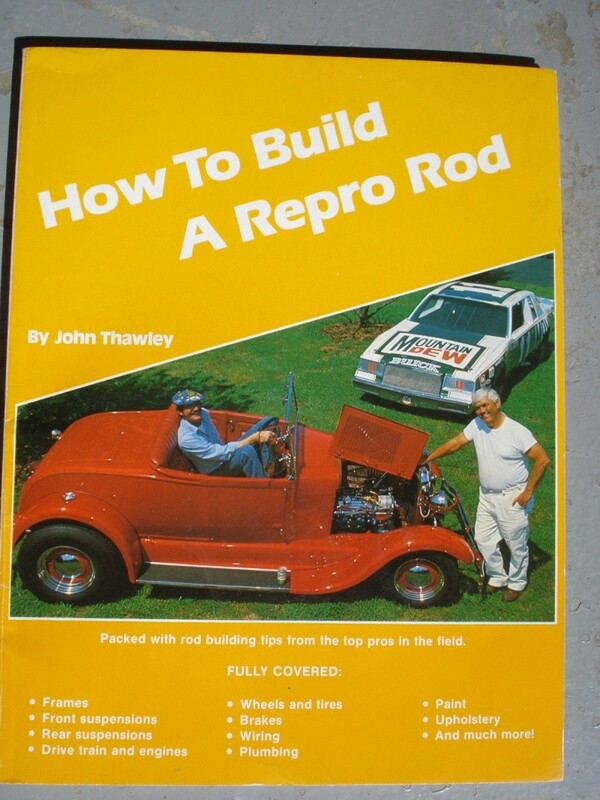 It is the cover car for "How to build a repro Rod", showing Junior Johnson on the cover with John. 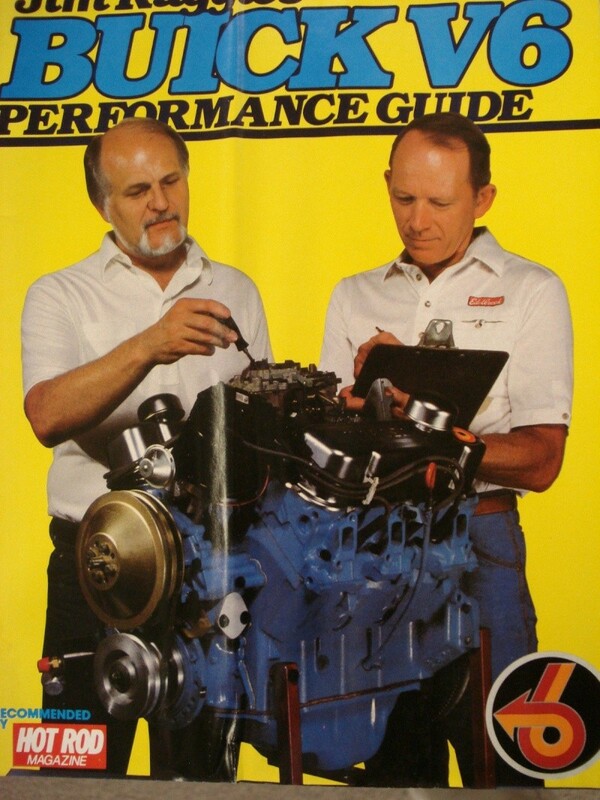 The car is also on the inside cover of Jim Ruggles' "Buick Performance Guide". 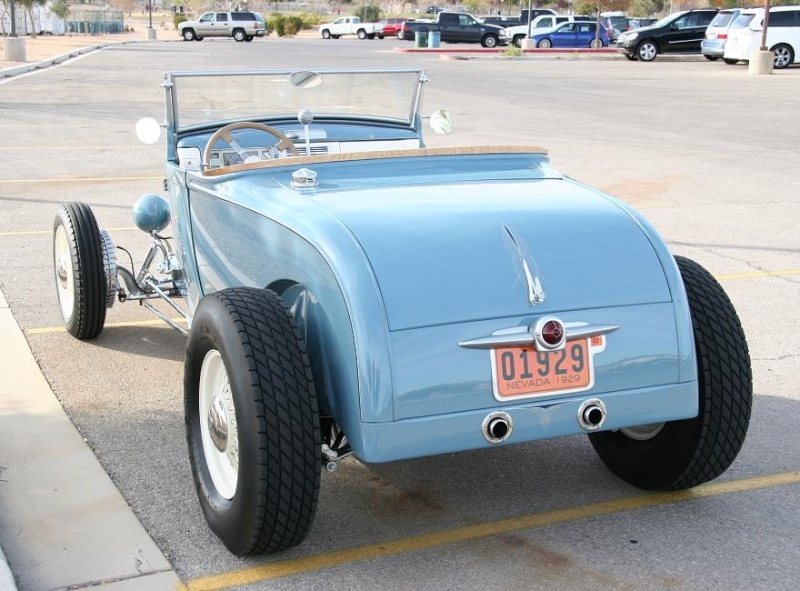 The car was purchased by a high ranking Buick executive and has remained in the family since. 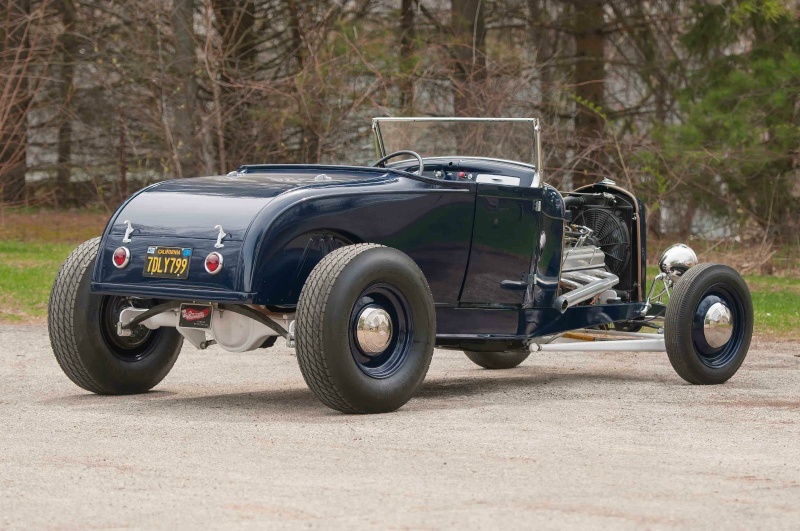 The car is in excellent original condition and is part of Buicks legendary performance history. Included are thirty custom lapel pins with the Buick "6" logo that was part of the PR campaign. 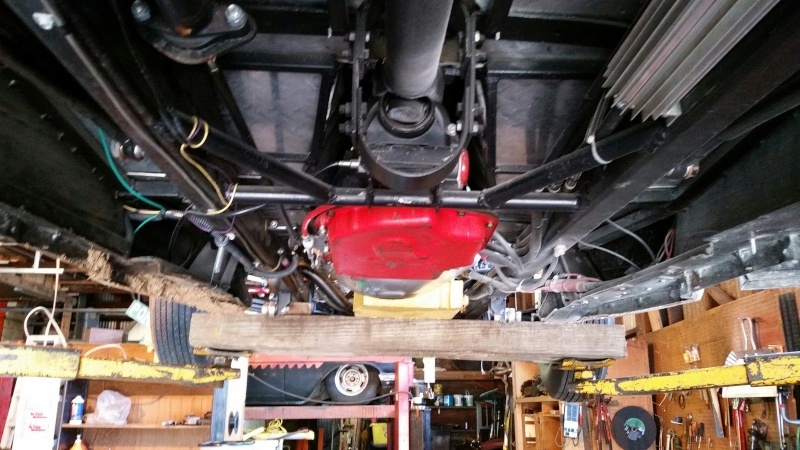 ENGINE 4.1 V-6, TRANSMISSION GM 350TH with column shift(tends to leak a little when parked for longer periods) CHASSIS TCI Frame, 4" drop SuperBell front axle-transverse spring and 9"Ford rear with ladder bar and coil-overs. 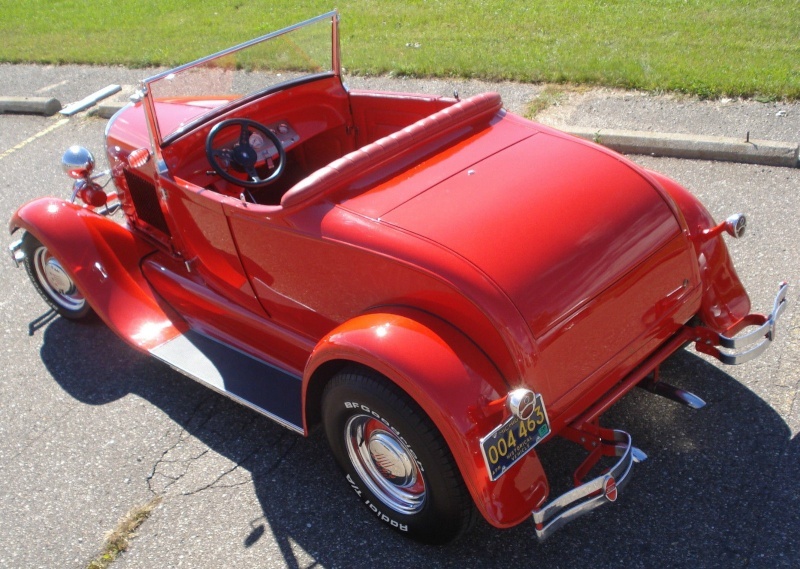 BODY by Polyform, bodywork by "Magoo", paint by Paul Bonanti, Striping by Sam Mc Farland. 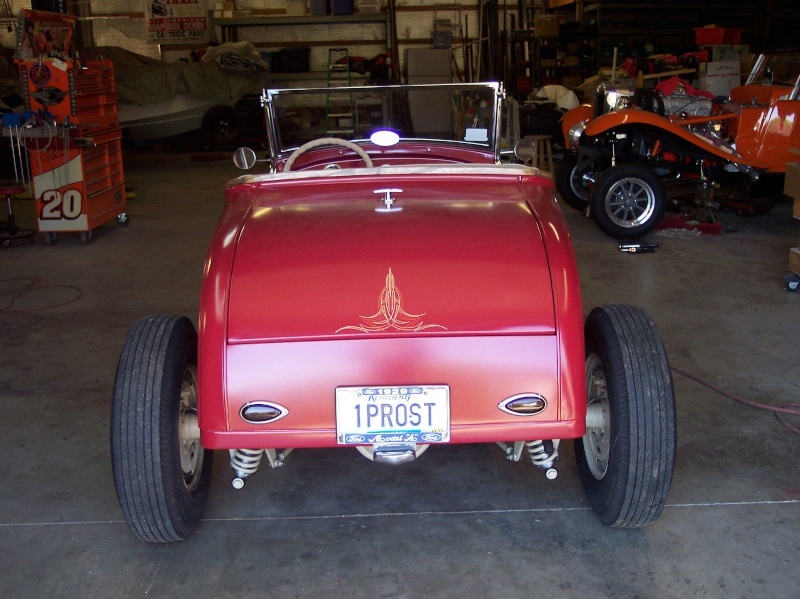 Ron Francis wiring.